31st July: The Week of the Potato - After noticing that our potatoes were getting gnawed by rats, we decided that rather than just feel dismayed, Abi would dig them all up. 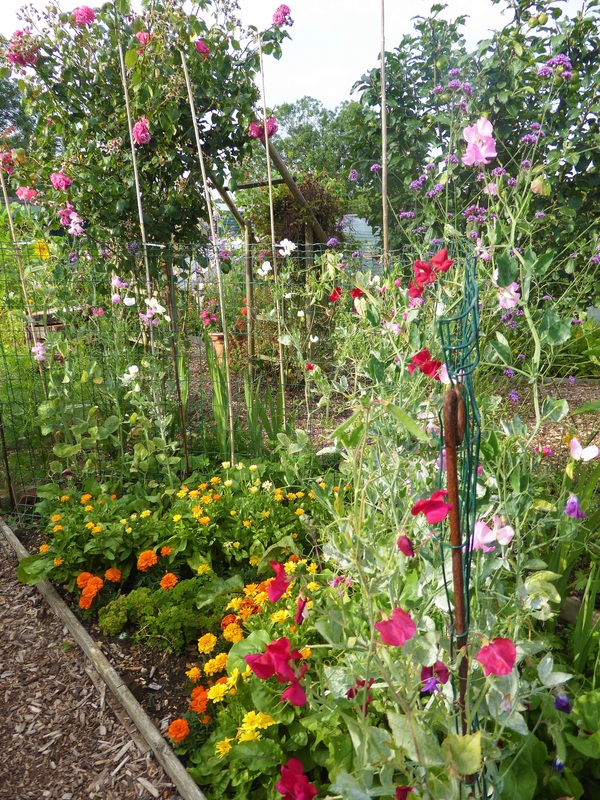 The second earlies and maincrops were both planted 18 weeks ago, and the foliage was well past its best, so out they came. It did seem a bit odd digging the maincrops up in July, as always previously it has been the end of August, beginning of September, but needs must. 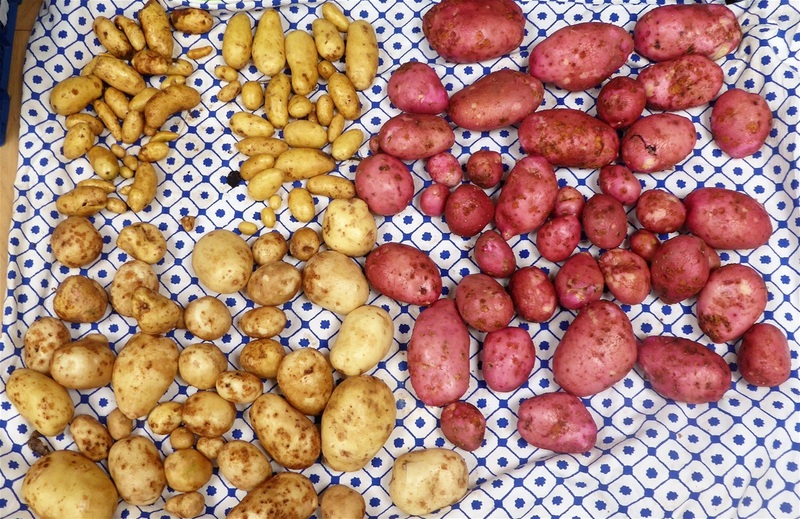 The first crop to the table for Harvest Monday is therefore... potatoes. Second earlies were our old favourites of Kestrel and Maris Peer, and although they were slightly scabby and not as large as in some years, they were certainly eatable.... I forgot to take a photo of them, sorry. This year we planted a range of maincrop varieties, to decide which we really liked and which would be left at the starting post. They were dug over two days, so two pictures. Pink Gypsy (some grown alongside first earlies too) cleaner skins than others, low yield although some a decent size. The results really speak for themselves as to which are Not On The List any more! The scab is a result of very alkaline ground on #145, after the previous occupant added masses of lime, but hopefully more manure will gradually lower the pH and reduce the scab. The first crops on #146 were like this, but six years later tubers come up nice and clean. Just have to persevere, and fortunately it does not affect the eating qualities of the potatoes at all. All the potatoes are now dried off, sorted into hessian sacks and stored in the garage on a thick mat to keep them off the concrete floor and avoid them freezing in the Winter. A further thick cotton covering over the sacks keeps the light out completely, so that tubers do not turn green. Next up are Runner Beans, which are in full production now. 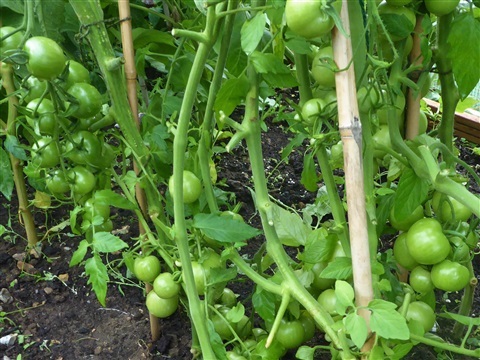 The X frame is certainly reducing the number of pods that get caught up in a tangle of stems and so grow all bent up, as you can see from this picture of the ones I picked yesterday. 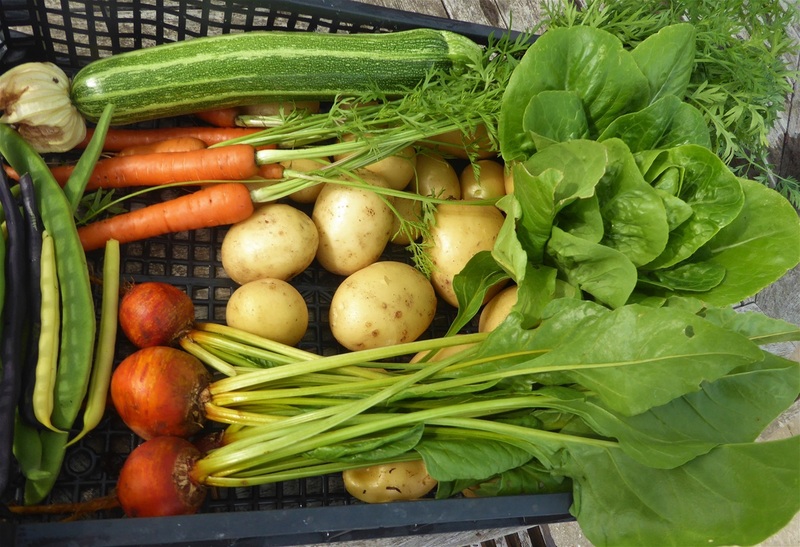 There was a similar sized harvest on two other days as well, so plenty to share and plenty to freeze too. 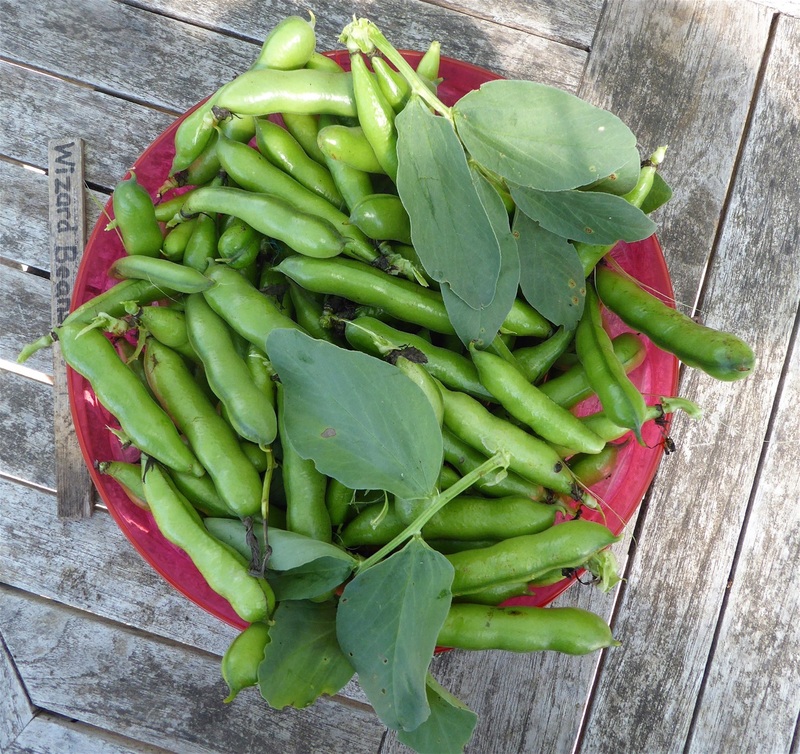 The French beans are slowing down a little bit, but there have been enough to freeze some. 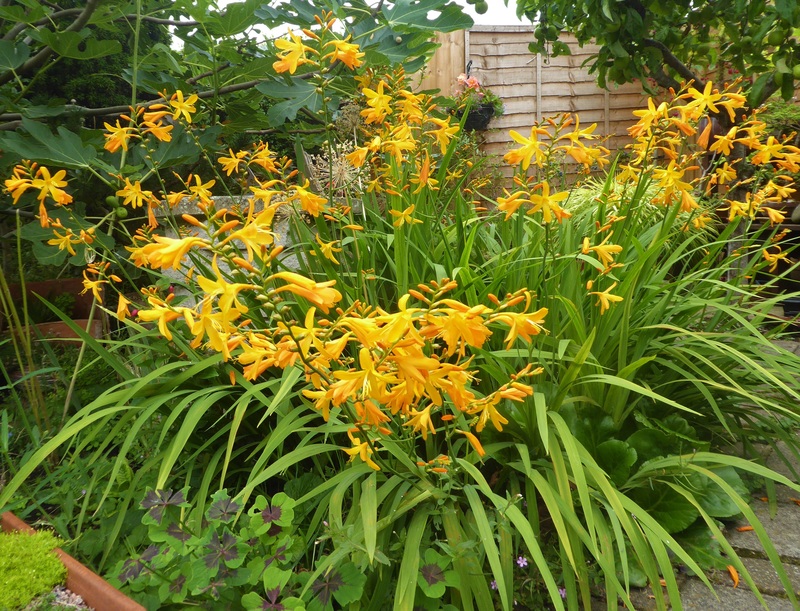 After last year's super-excess, we have reduced the number of plants, which was probably a good idea. 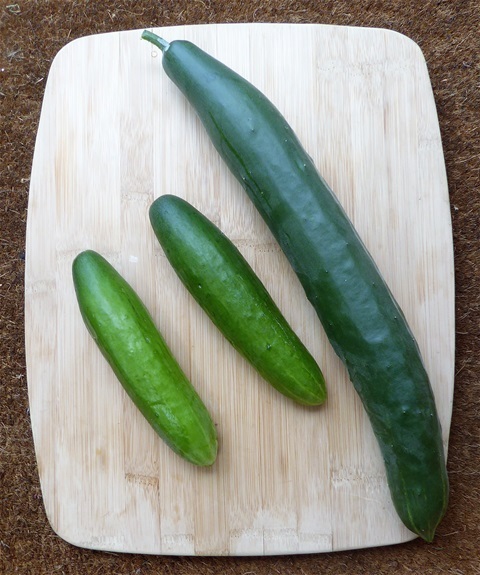 Cucumbers are coming thick and fast, well, very thick in the case of the Diva which hid behind the edge of the raised bed in the polytunnel and grew to mammoth proportions... oops! 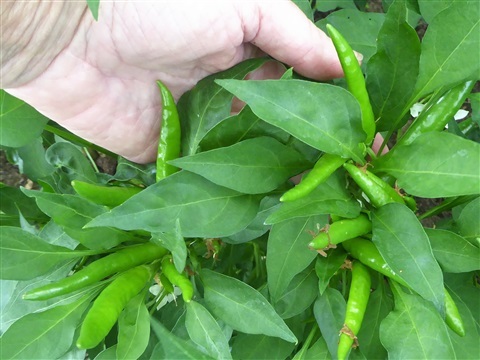 The Lemon Crystal ones are nice and juicy, and the outdoor Chinese Slangan plant has plenty of large fruits too, some of which we have already harvested. 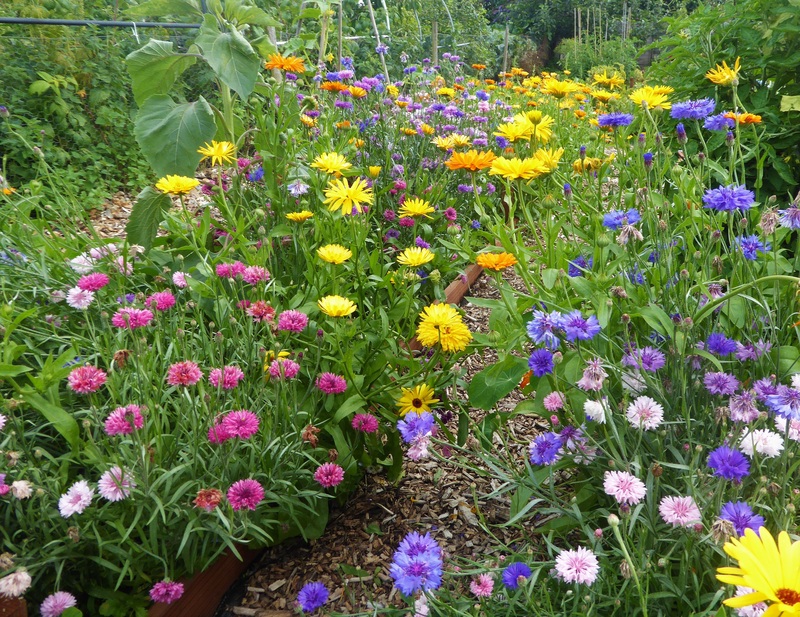 I only grew these as the seeds were free, and they are proving themselves worth the effort. There are two in the header photo so you can see what they are like. 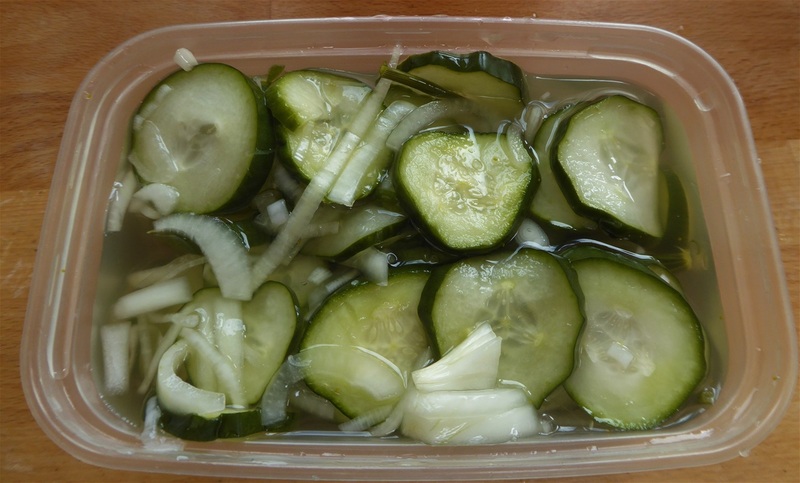 I have made several more batches of Dilly Cucumber Fridge Pickle, and the recipe certainly seems to have been popular wth lots of you too. 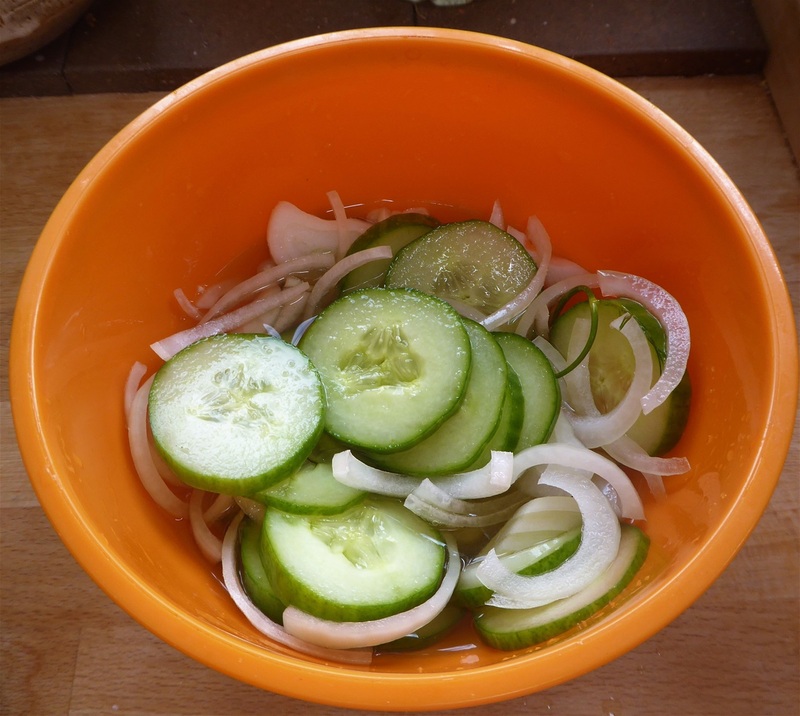 Thank you for the version with sour cream, and for the recipe for a fermented cucumber pickle with ginger in it. I'll be trying these out during the week, and sharing how they come out for me... good, I hope! 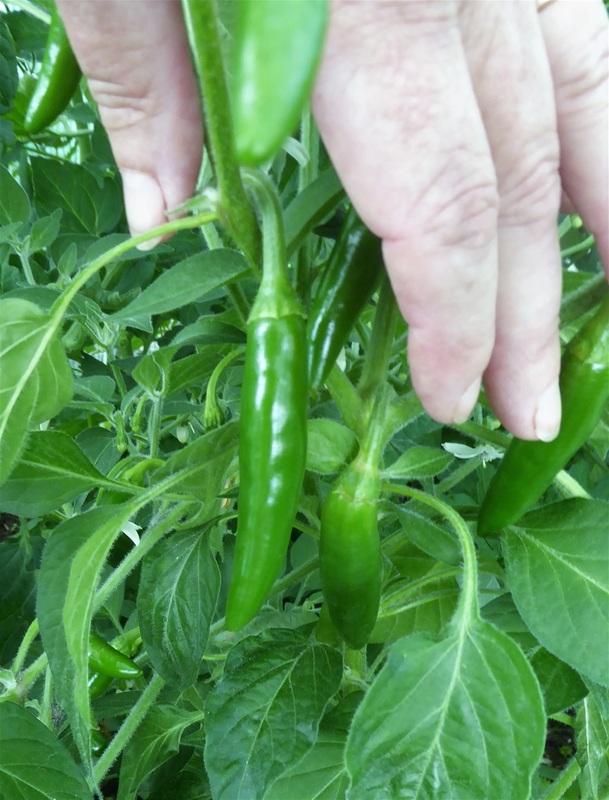 With all the chillies we have growing, I thought it was time we started eating them, as green chillies taste beautifully fresh. 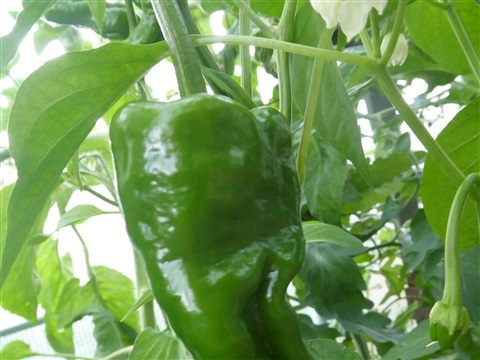 The large beast is one of the Hangjiao1 fruits, and true to expectation, it is very mild indeed. 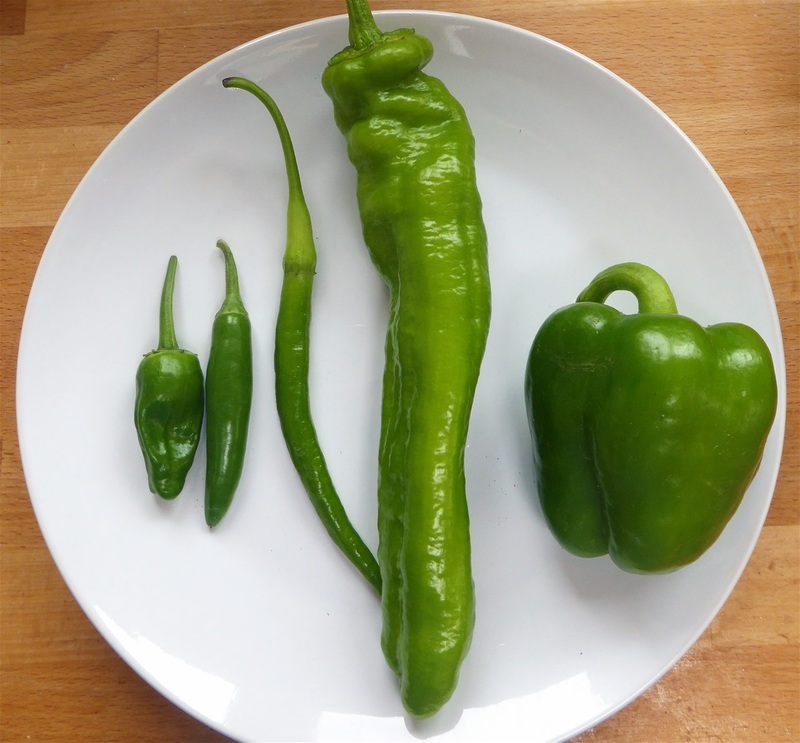 The others, going right to left, are a Cayenne, a Jalapeno and a Padron, all of which had a decent bite to them. The green sweet pepper got knocked off while I was pruning the cucumbers, and it went in the stir fry. We have had a couple of the cream coloured ones this week too, in a mixed salad. 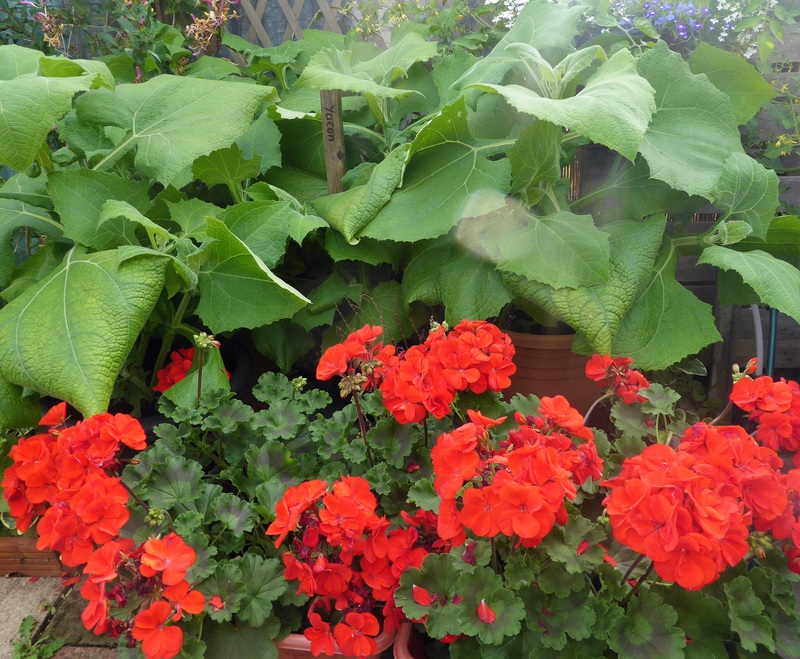 These are something else that I have planted too close together: the plants have grown much larger in the polytunnel than they did under the large cloche, so I need to remember that next season and give them a bit more space. 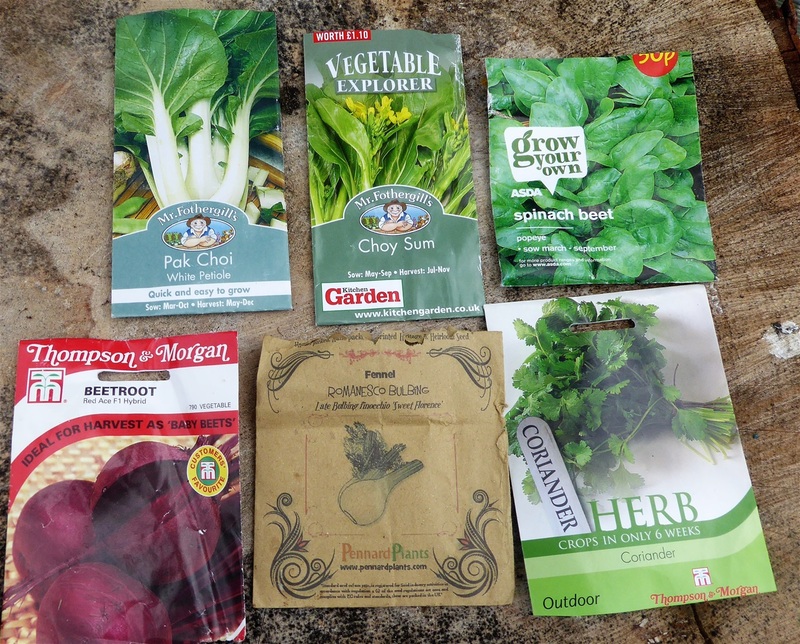 We have also had several Little Gem Lettuces, some courgettes, beetroot that the rats didn't notice, and some more carrots this week. Meals have been very varied this week! 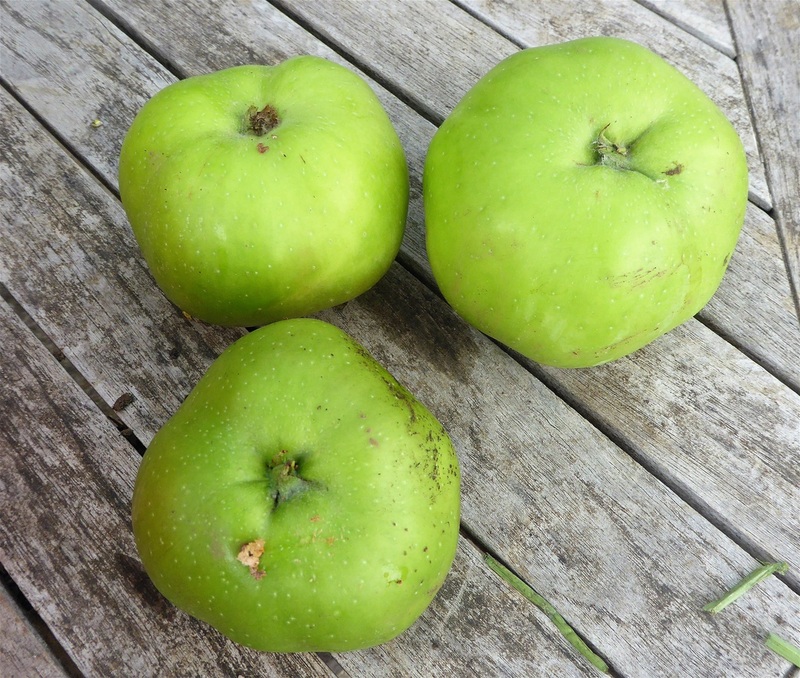 The windy weather dislodged some of the cooking apples, which are a very welcome addition to the blackberries. It also led to one of the branches on the Discovery apple tree at home snapping completely, losing us quite a lot of apples. With some careful staking I think the rest of the branches will be able to carry the weight of fruit alright. Hope so. We are picking blackberries almost daily, and in addition to blackberry & apple compote, there is a large jar of blackberry vodka "doing" on the dining room table. I strained and bottled the raspberry vodka to free up the jar, and using less sugar has given a very refreshing drink. I then remembered that there was some blackberry & apple gin in the garage, from back in 2015, so that has come in now.. very nice over ice. A batch of Bramble & Rosemary Jelly is now made, which has a good background sharpness to it. The plan is for it to be an accompaniment to roast meat, enrich gravy or casseroles etc. 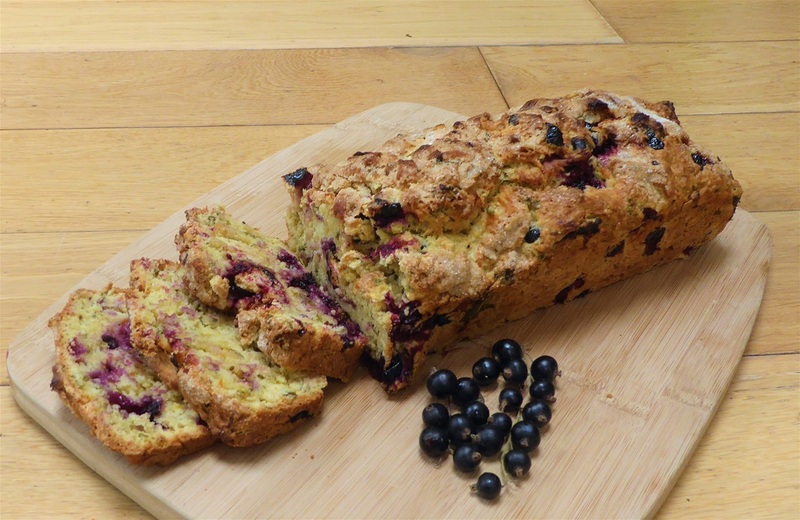 Recipe will follow tomorrow, in case anyone would like to have a go. Raspberries we just eat with yoghourt, and very good they are too. And that is the end of our harvest information this week. After last week's re-evaluation of "The Plan", we have been busy making sure the follow-on crops are in the ground. Even the one rather sickly Romanescu plant has grown well. There seems to have been more time to enjoy the beauty of what is around us, despite all the potato digging and sorting, so here, to finish, are some pictures of our flowers in the garden and around our plots, an insect we have never come across before ... a Sloe Shieldbug ... and one of the bees in our garden, which are very amusing when they race around these Japanese anemone flowers, vibrating their wings like mad to dislodge the pollen. As you can see, this one has been very successful. I hope you enjoyed reading this week's blog. Thank you again for your comments and recipes. 24th July: Time to rebalance, in all sorts of ways! This is the time in the year where the Grand Plan is reviewed and adjusted, to make sure that there is space for both this year's ongoing sowing and planting, and the coming 2018 season's crops. This means that soil health can be maintained through crop rotation, and through timely incorporation of organic matter. 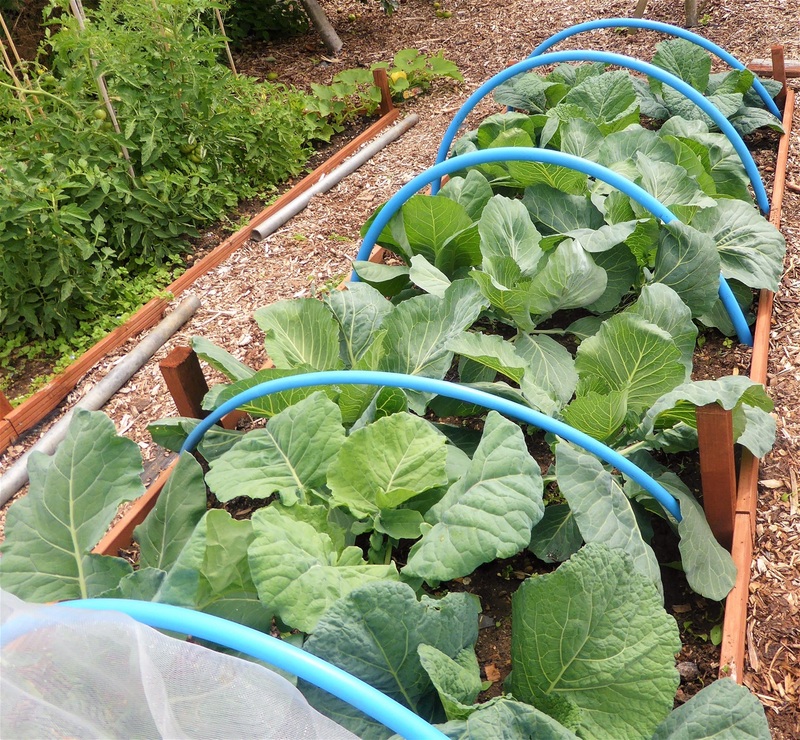 Carrots, for example, do not grow well in ground recently manured, brassicas enjoy the extra nitrogen in the soil from a previous crops of beans or peas, potatoes prefer less limy soil than cabbages, and so on. 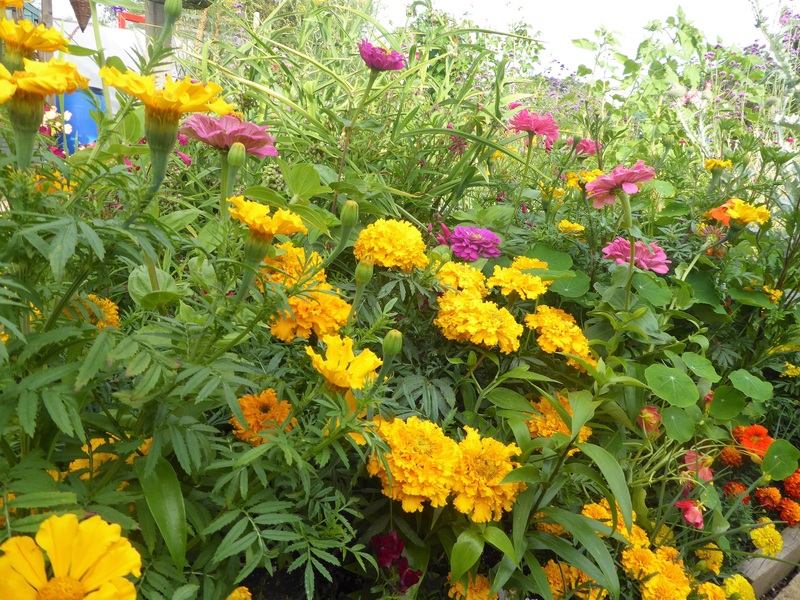 In this way, our plots can remain steadily productive throughout the year. We have noticed there seem to be fewer worms in the soil than we'd like.... something to look at further. 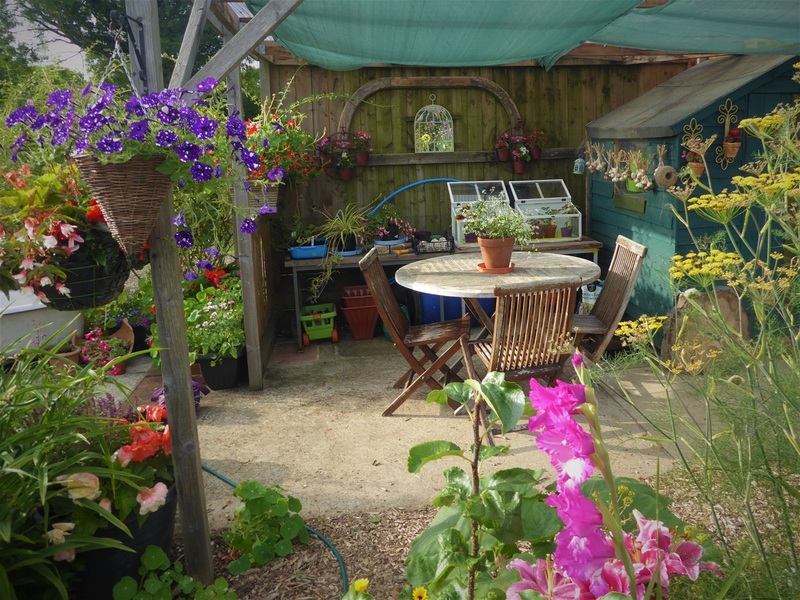 We have also had to take a deep breath after our plot sheds were broken into this week, as this sort of thing leaves you feeling violated and vulnerable. Trying not to dwell on it too much and get on with the positive side of life, but it has not been easy. 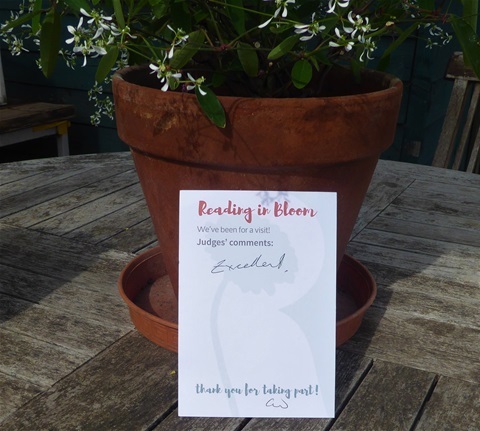 Some good news came from the judges' visit to our plot, linked to Reading in Bloom, who left us a card thanking us for taking part, and with the comment "Excellent! ", which was very much appreciated. 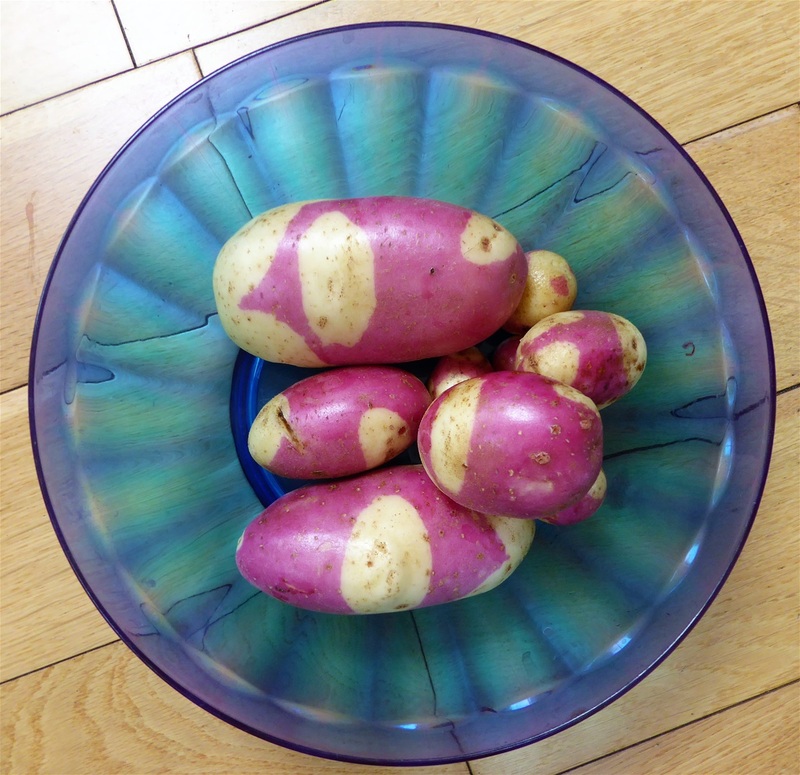 This week, we have some new pickings to celebrate Harvest Monday, the first of which are these rather exotoc looking potatoes: Pink Gypsy. 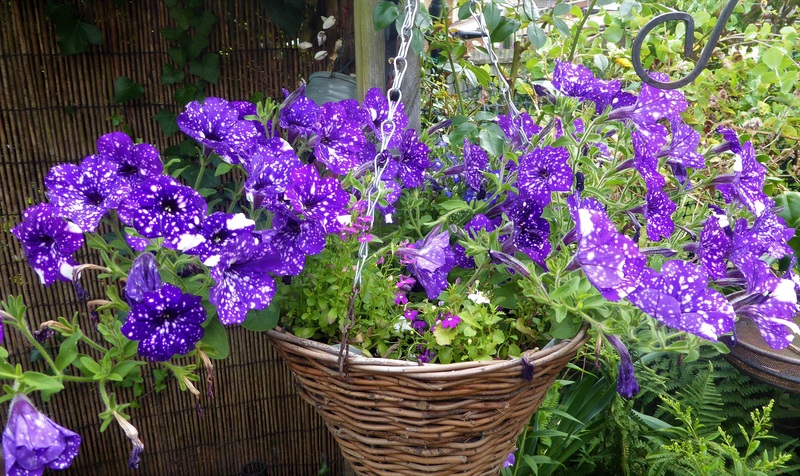 They were certainly not the most prolific, but must surely be the most beautiful! 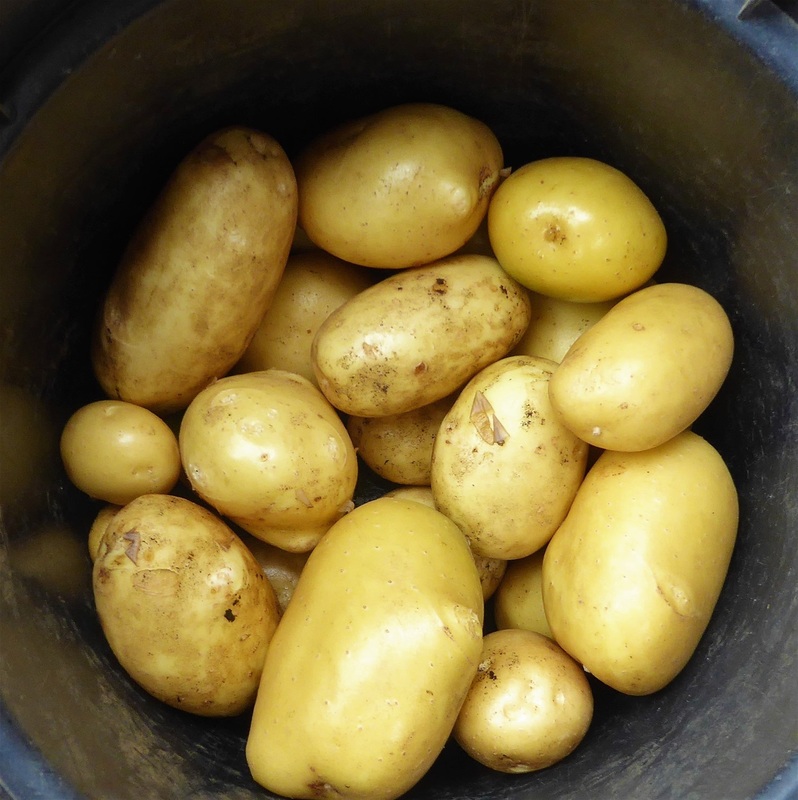 We have now emptied the First Early potato bed: Lady Christl, Charlotte and Carolus have all been good, with scab-free skins, and are currently On The List for next year. There have been enough Lady Christls of matching size and shape to keep for the annual Show, carefully wrapped in paper, stored in a box in our spare bedroom. 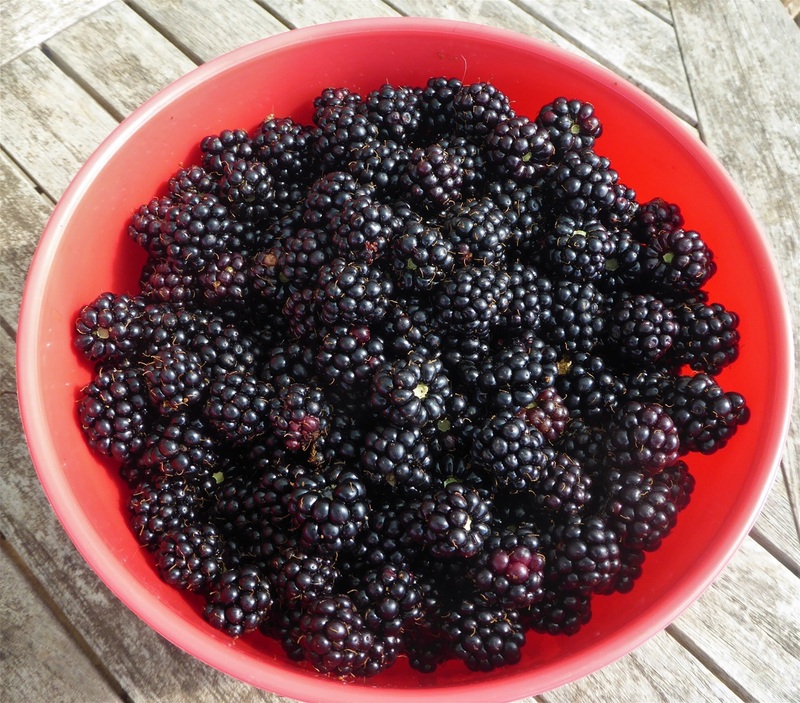 Blackberries are slightly earlier than usual this year, and I couldn't resist picking these yesterday, gleaming in the early morning sunshine: stewed Blackberry & Apple to follow! 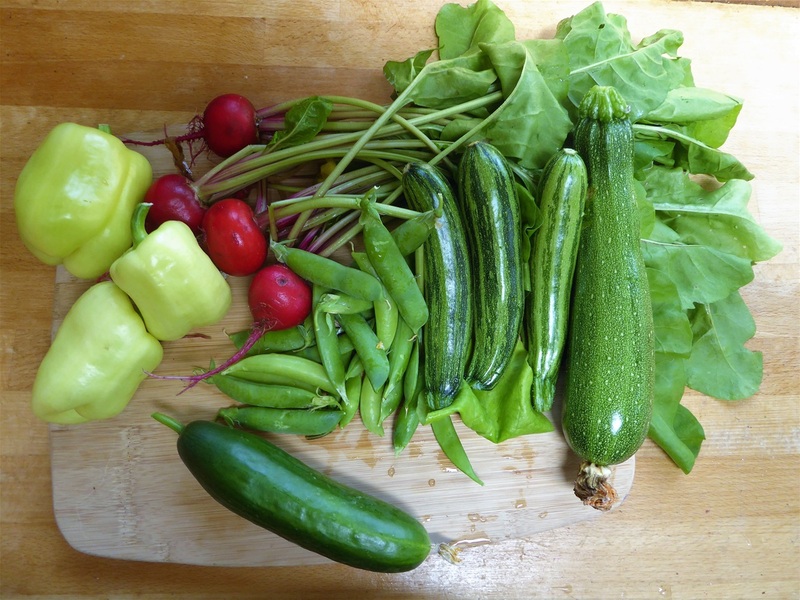 It is so satisfying going home with varied baskets of produce several times a week. The first job when we arrive is to store the veggies away, either in the fridge, or in a vase or two of water to keep things fresh. I haven't photographed the large basketful of runner beans I picked this morning, or the purple and green French beans. These are destined for the freezer this evening. 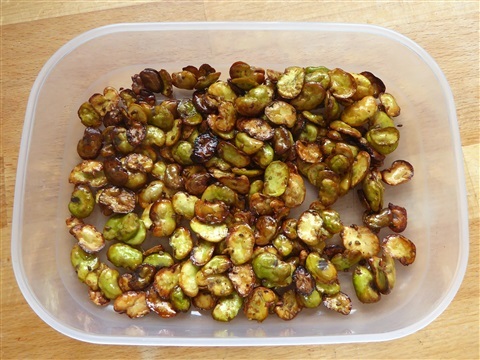 We have also had enough beans to share with neighbours and friends already, which is great! 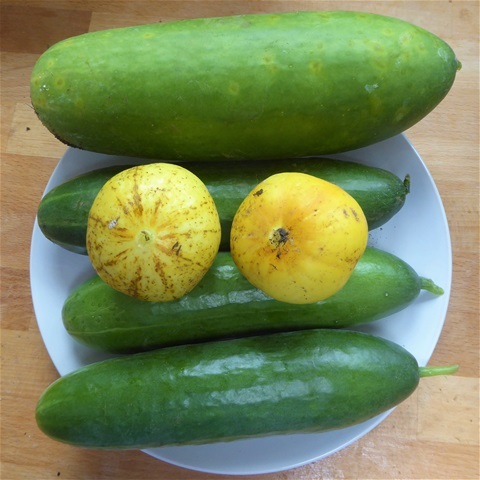 Courgettes are also being sent to new homes from time to time, as you can imagine! A quick word about the cucumbers; The Three Divas in the polytunnel have upped their game, and when you add the occasional Telegraph, we have plenty alright. Coming along in the wings are the outdoor Chinese Slangans, which I can show you next week. Not had all that much success with outdoor cucumbers really, but these look like they are going to give us quite a few fruits! 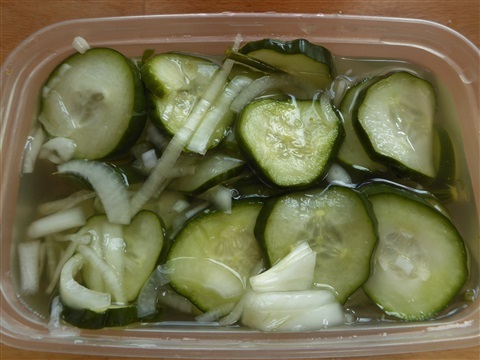 I made several batches of Cucumber Dill Fridge pIckles (recipe tomorrow) which is so delicious that it really doesn't hang around long. And then the next morning, it is like this, crunchy and fragrant! This is the first of the main crop onion harvest.. smaller than usual but glad to have anything edible after the attack of the Allium Leafminer earlier in the year. They will stay on the rack under cover until the leaves are fully dry, then we can store them somewhere light and cool. 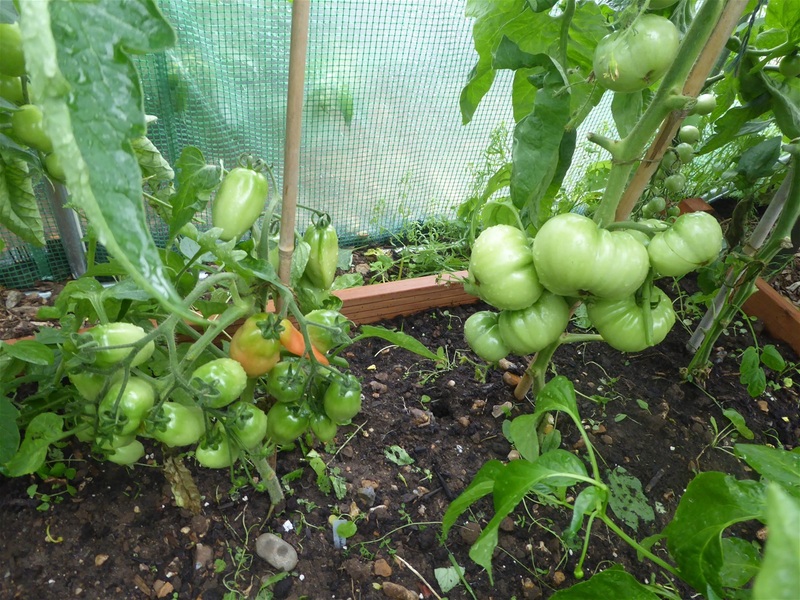 There are more on the other plot, but they are still growing so we have left them, as they may still increase in size. That is the end of our harvests for this week. One the onions were out of the ground, I transplanted some of the foxglove plants that had sprung up amongst them to one of the flower beds on #145, and gave the soil a sprinkle of Blood' Fish & Bone ready to sow some perpetual spinach and Florence fennel, as well as some more beetroot. The red Boltardy beetroot have been very popular... with the rats!! The little blighters have been secretly munching away with devastating results as you can see, so traps have gone down tonight. 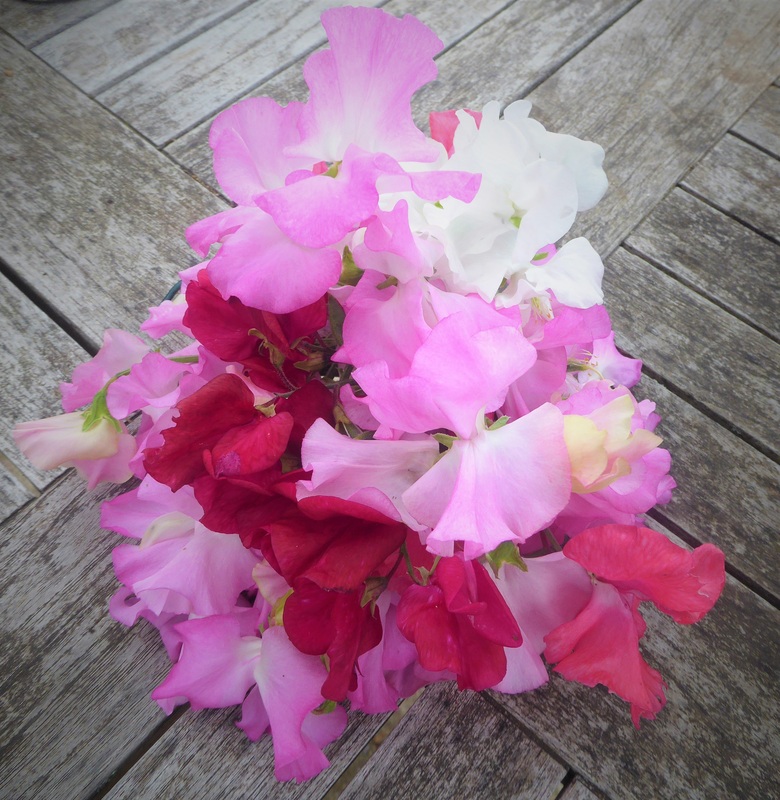 I didn't grow these to feed rodents, so I am hoping the lure of peanut butter will end their days, one at a time. We shall never get rid of them all, as we are right by the water meadow, with farmland on two sides and the fourth being a sports field, but keeping numbers down is always a priority if we are to be able to eat what we grow. 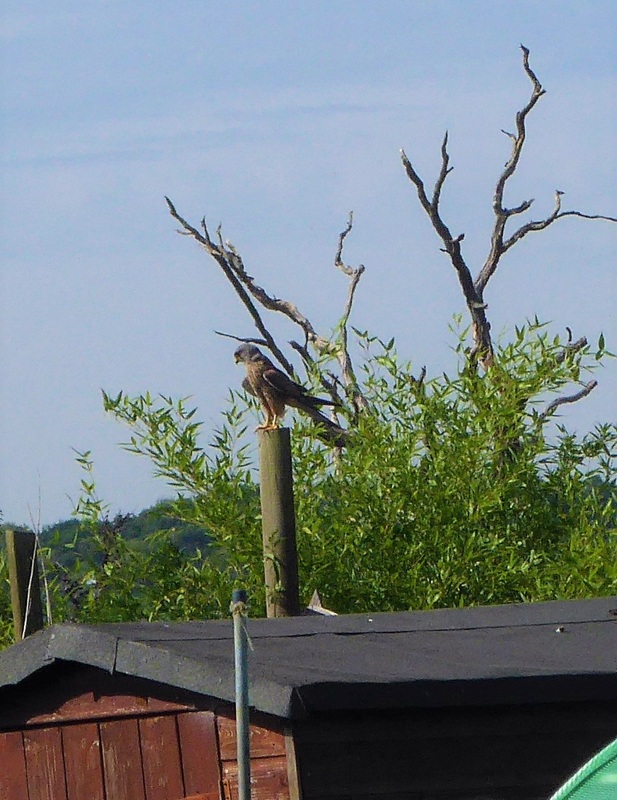 Usually I end with photographs of flowers, but what with one thing and another I've not taken any this week... but... we now have a male kestrel living in and around our site. He is very skillful at catching small rodents, and often sits on this post in our neighbour's plot while he eats them. He is a beautiful bird and we are lucky to have such close views of him most days. Only a shame he doesn't tackle rats really, isn't it? 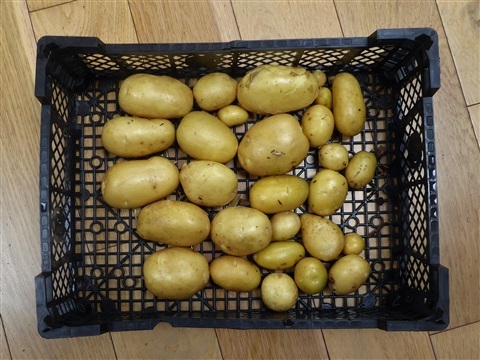 Next week, as well as sowing some seeds, we plan to dig up the long bed of second early potatoes and dry them off to store. Not sure if there will be time to fully prepare the soil to plant out more leeks, as there are a couple of wet days forecast, but we shall do our best. 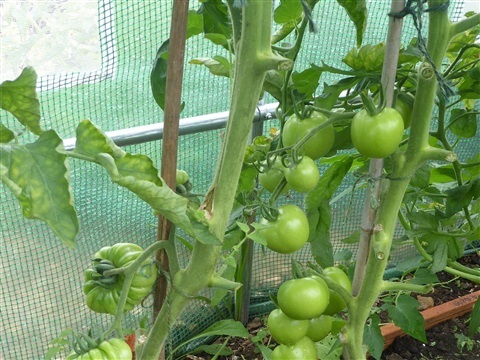 I also need to decide when to module-sow crops to follow on in the polytunnel from the tomatoes etc. Seems odd saying that when we haven't even started harvesting tomatoes yet, but time has a habait of catching up with me somehow! Mind you, we do really need some rain, so let's hope it is not actually an accurate weather forecast! Here are some views around Plot 146 this afternoon. 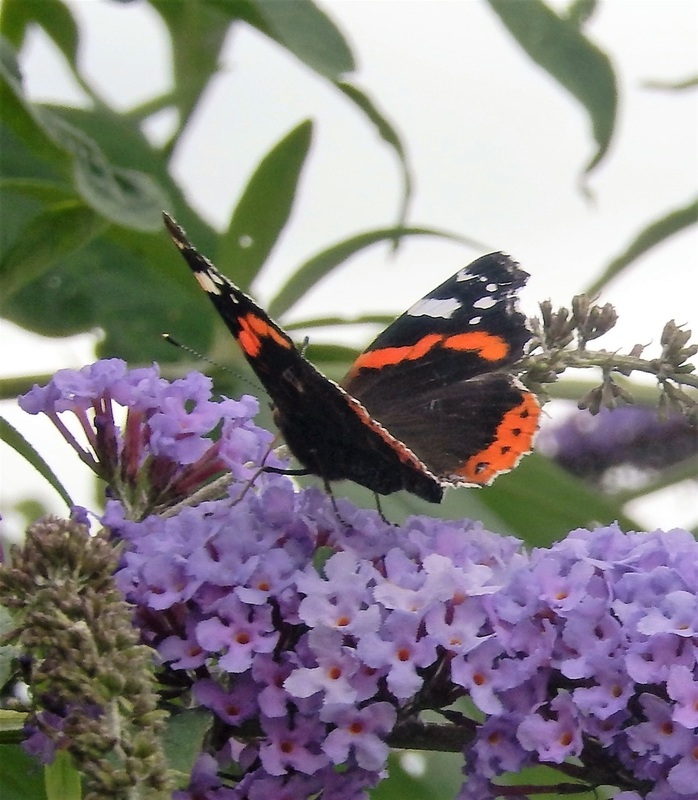 Glad that dahlias are starting to flower, and the verbena and buddleia are doing a great job in attracting insects as well as looking lovely. We counted up and have twelve different kinds of soft fruit, five top fruits, thirteen herbs, at least nine different edible flowers and twenty six types of vegetables (counting beetroot once for example, not three time for three different varieties, and not including crops like broad beans, mangetout etc which are finished, or any growing on Plot 145 or in the polytunnel, or those that are still in the packet like florence fennel or spinach) Never counted up like this before... no wonder we eat such a varied diet! 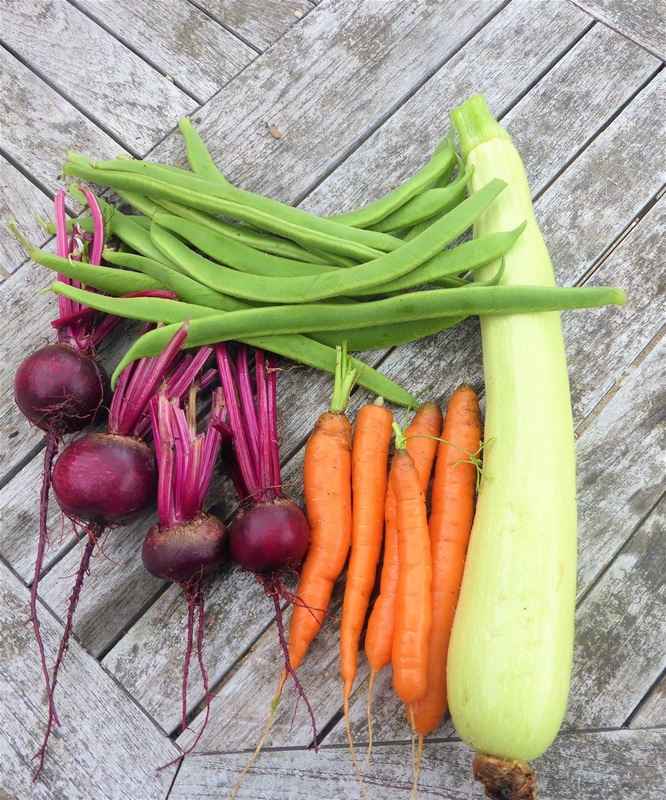 We have had some new harvests this week, so I can share their photos with you for Harvest Monday. 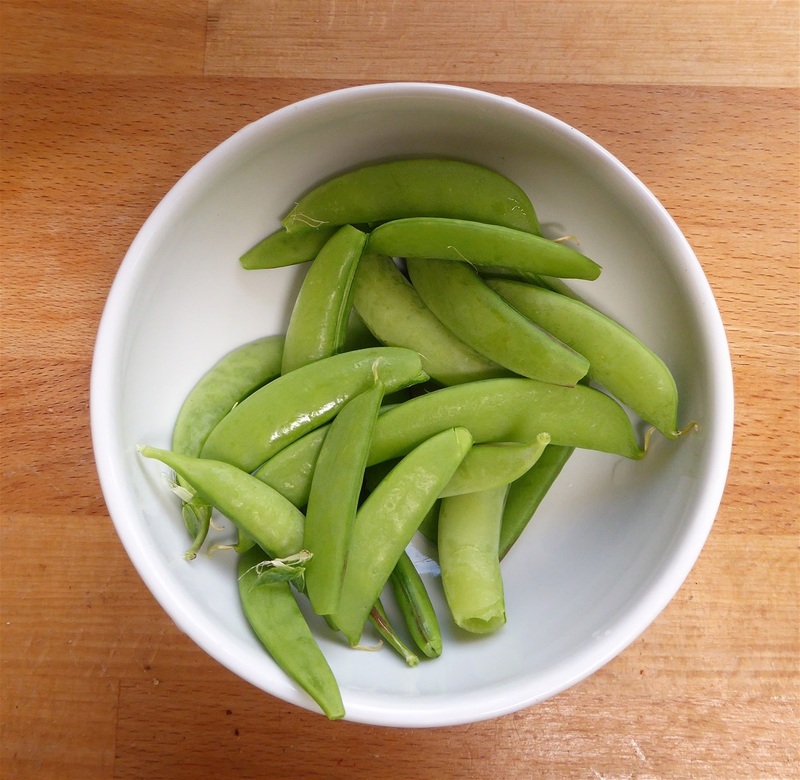 First up are the long awaited climbing French beans, succulent and tasty cooked simply, or sliced raw in salads. 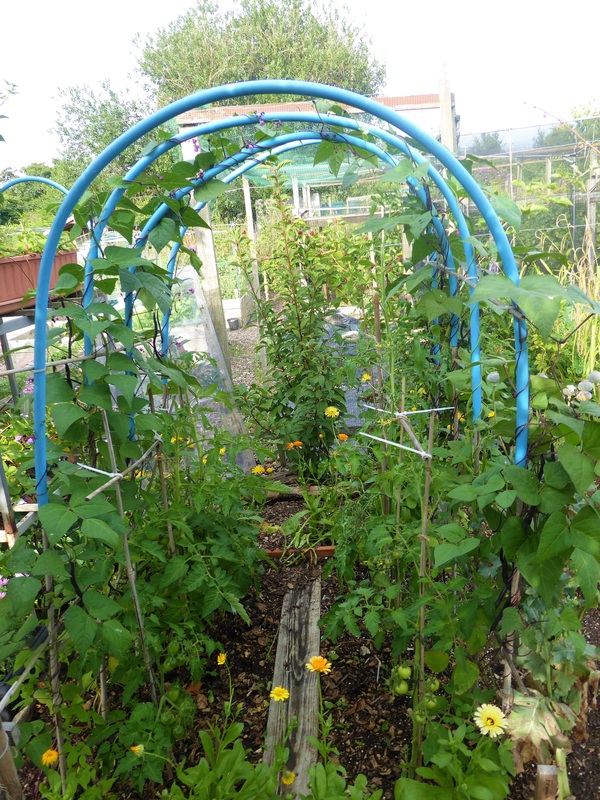 The dwarf yellow beans are also cropping, and I noticed some green pods on the arch too.. bean medley! 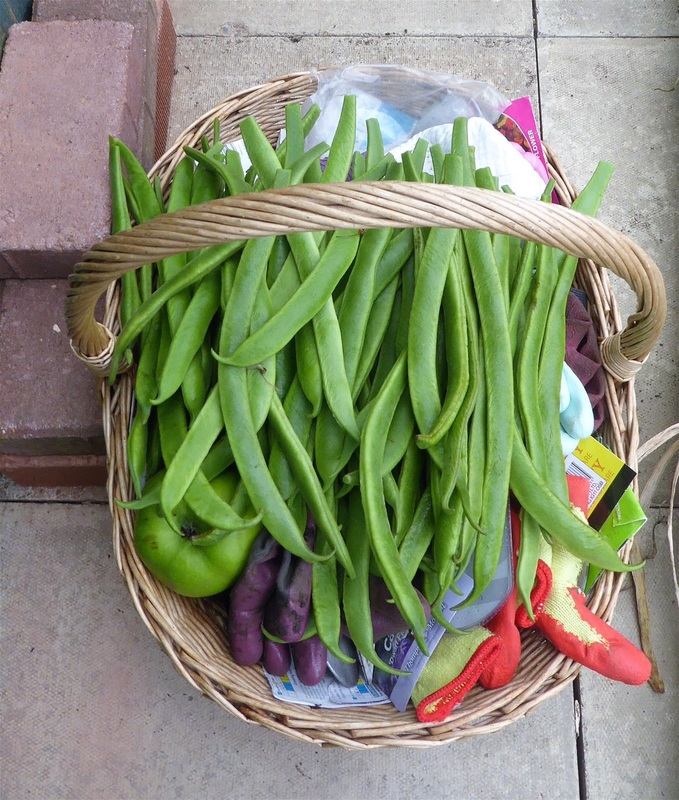 And then there are the first crop of Runner Beans too. 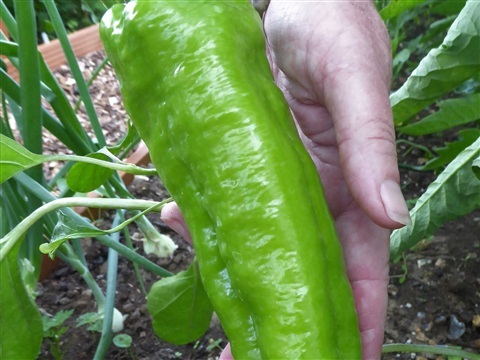 All varieties are producing pods, and it is important to pick them once they are large enough to eat, or the plants stop flowering. This is because the plant notices seeds are forming in mature pods and so ... job done. There is no need for it to carry on growing as the next generation is then secured. It is easy to miss pods that form low down on the plants, so a good search through the foliage near ground level is a good idea! 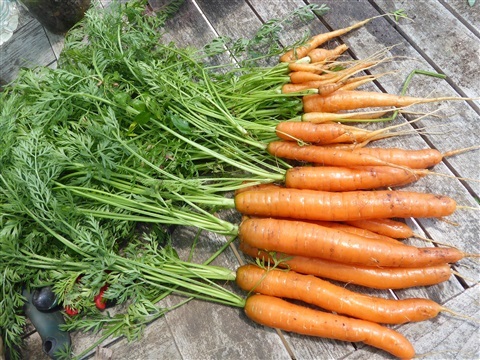 Also in the picture are more carrots: the battle with the mice goes on, with one and often two being trapped every day. There are still some nibbled and chewed roots, but just think how bad it would be with all those other mice feeding there too! Beetroot are large enough to eat. 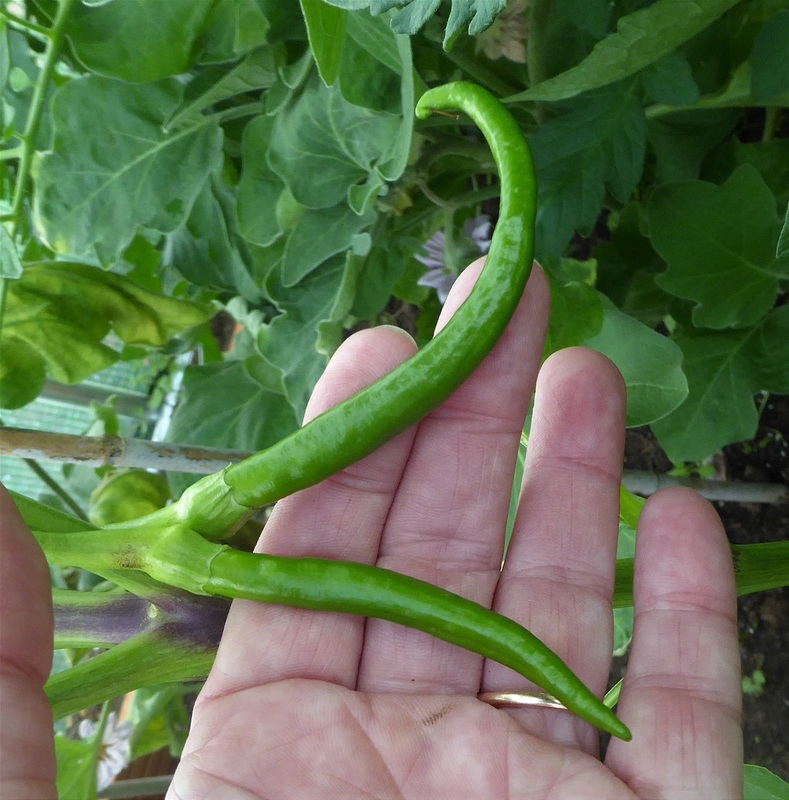 These are Boltardy, and really I sowed them too close to a row of dwarf calendula, so they haven't had the best growing conditions so I am pleased to have some to eat. We roasted these with potatoes, and they were really good. Courgettes are growing well.. You wouldn't think that fruit this size could grow unnoticed under the leaves, but this week we have had two large ones from Lungo Bianco, fortunately not large enough to be "seedy". One was used with sliced onion in spicy pakoras, and the other added to our roast dinner, sweated in butter with caraway seeds. The stripy Coucouzellas are regular additions to almost anything, and with two plants there are plenty, but not an overwhelming amount! We ate them before This photo was taken! 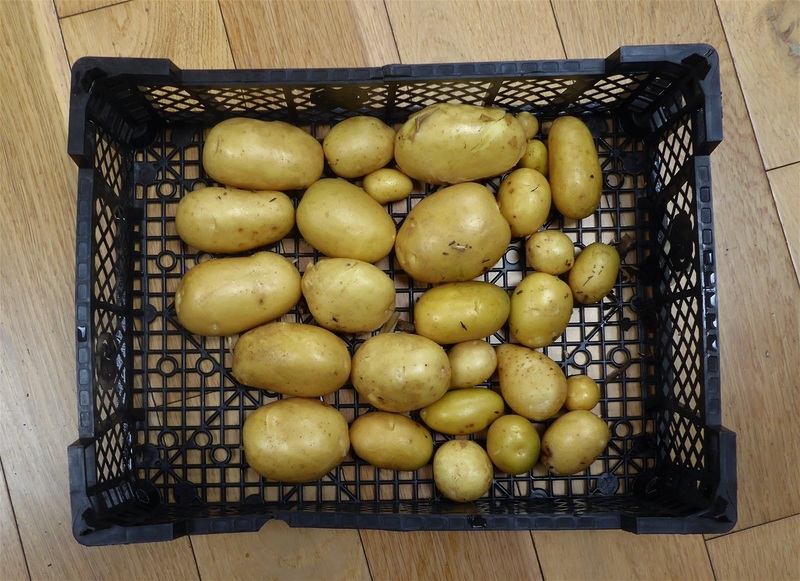 We are still harvesting the first early potatoes, with another four rows still left to dig. I had really wanted to get the leeks planted out this week, but that had to be postponed once we knew the date of the plot inspection, which is two weeks earlier than it has been in recent years. In the polytunnel, the Diva cucumbers are cropping quickly, with enough for us to eat daily and some to share with friends. 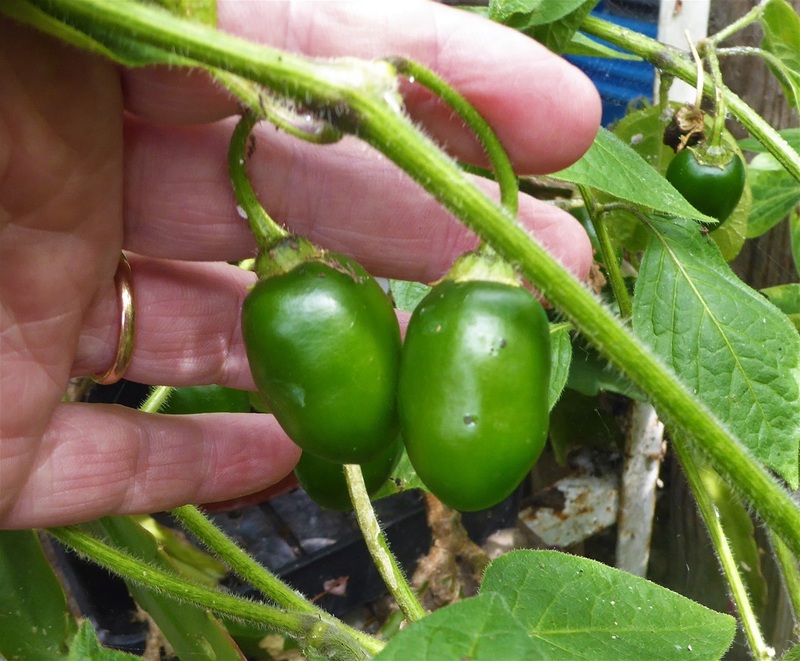 I picked the first of the Telegraphs in the greenhouse at home: beautiful! 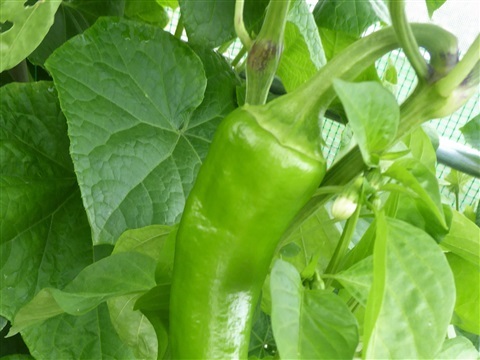 Other Summer crops like lettuce, sweet peppers and salad leaves are doing well, cropping fast enough to keep us well supplied. That is end of our harvests for this week. This seems to be a good year for pears. Everyone we know who has a tree is saying the same, and even our little trees on #145 have some fruit on them. 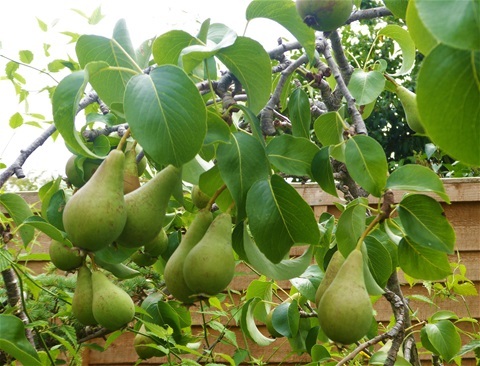 In the garden, both trees are heavy with fruit: we are trying to keep them all well watered so that the fruits continue to swell. These are some the Concordes: you can see why we are looking forward to the coming harvest! That wasn't the only treat though... just look at these caterpillars! 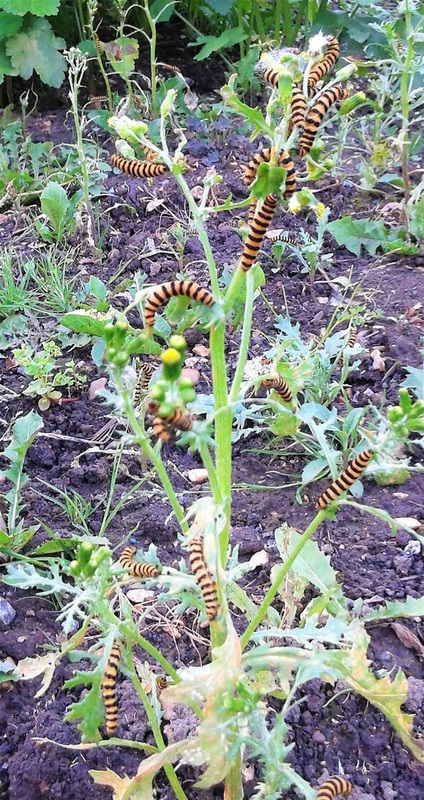 You might wonder why I was so excited by a plant covered in Cinnabar moth larvae, but it was a real blast from the past for me. 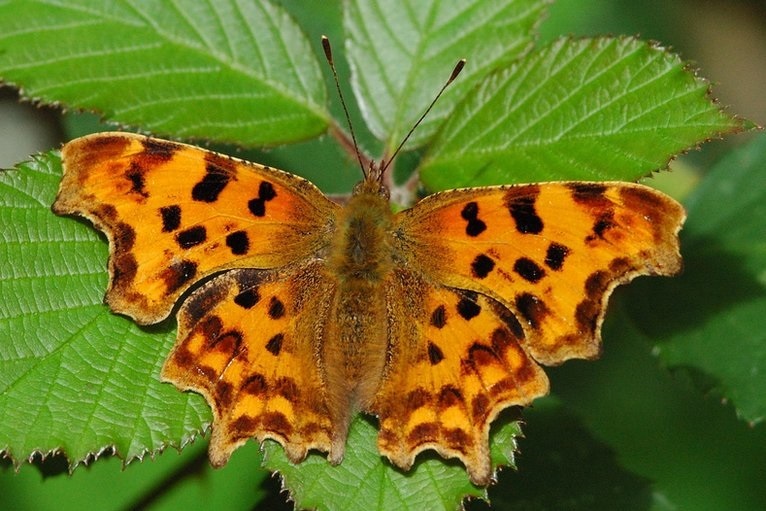 When we were children, my brother and I collected literally hundreds of these and kept them in netted potato barrels in the garden, feeding on ragwort, until they pupated, when we packed them up in cotton wool inside old tobacco tins wrapped in brown paper,and sent them off to Worldwide Butterflies, who were acting as a collection point before shipping them to Australia to help tackle their ragwort problem. We got old sixpence each per tin, so you as you can imagine, we were very keen. We had to keep them well supplied with ragwort, as otherwise the larvae would eat each other, and our profits would rapidly diminish! 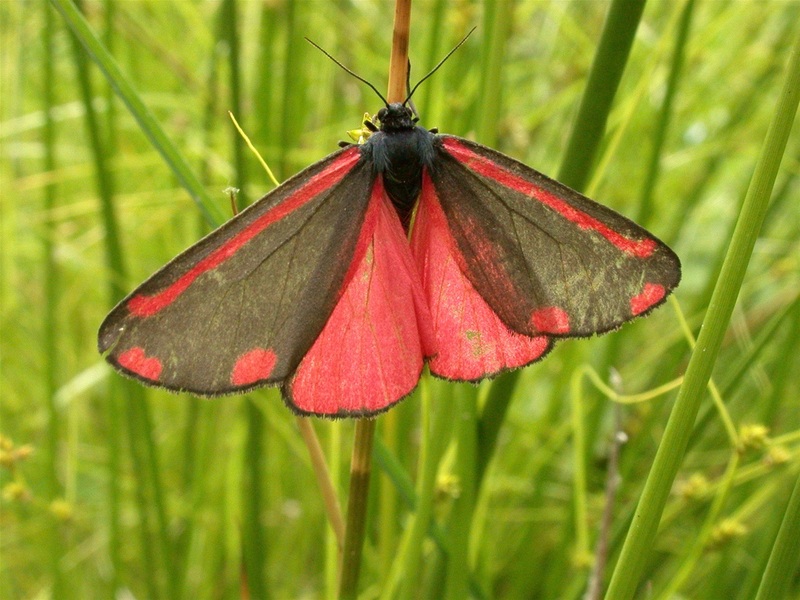 This is the adult moth, which is around from May until early July in this area. 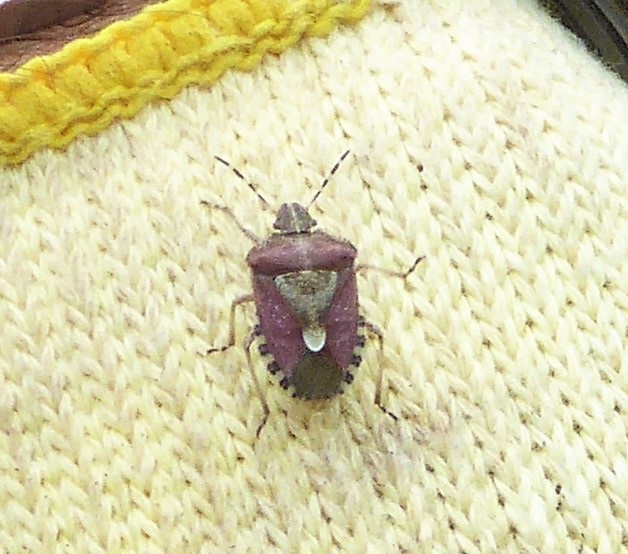 If it is disturbed, it flies about in the day time and is very visible with its bright coloration. Like its caterpillars, the moths taste unpalatable to predators, and these colours act as a warning to them not to try to eat it. Pretty though! Once again, thank you for reading this week's blog. I hope you found it interesting, even if the week didn't go quite according to the original plan! 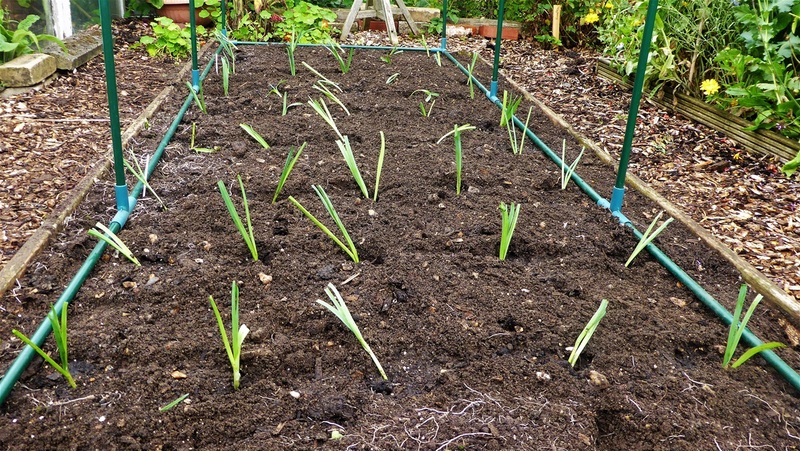 Those leeks really must go in the ground of course, and the onions on #146 are nearly ready to take out of the ground for drying off... space for sowing spinach then, and some Florence Fennel too. The onions on #145 have not started to leaning over yet, so they can carry on growing for a while longer. And I wonder what the weather will do??? 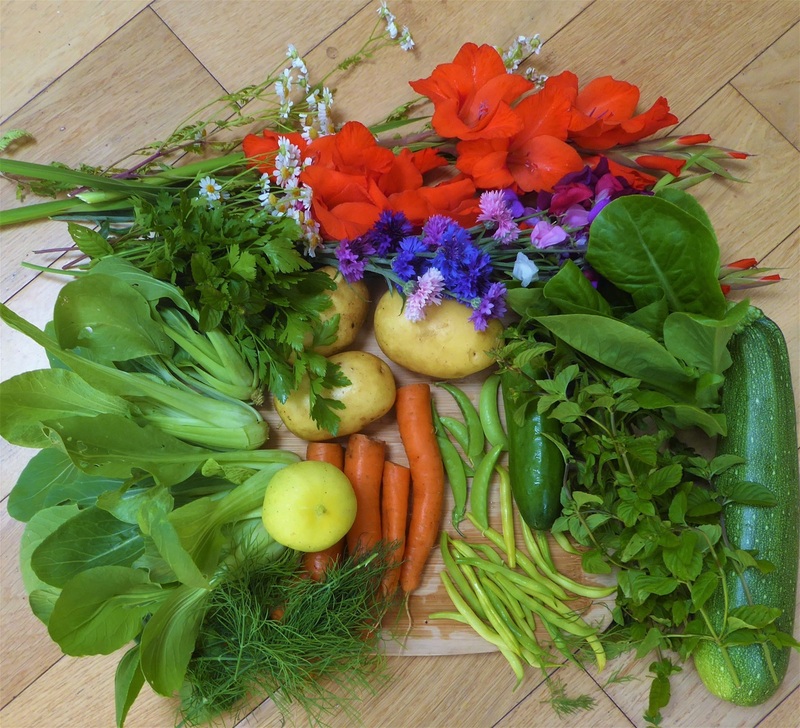 10th July - Colourful Summer harvests are well underway! 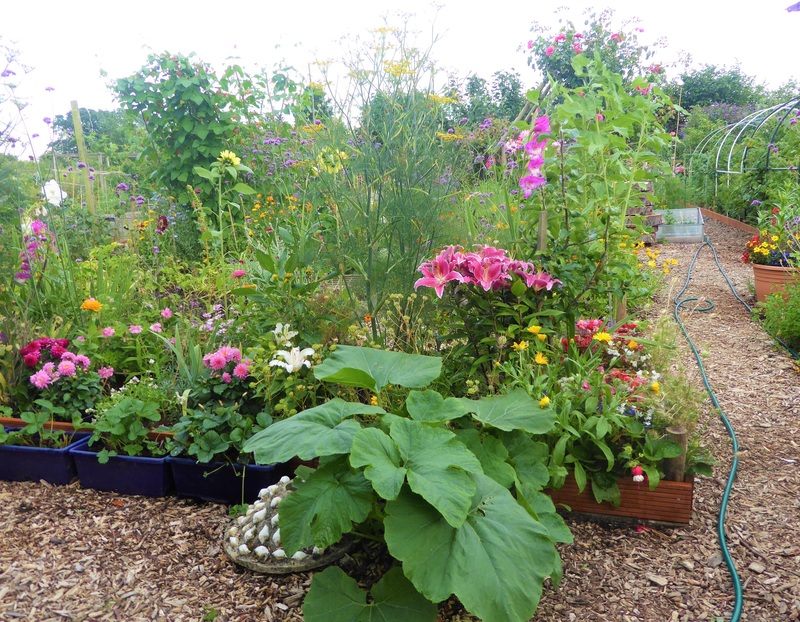 We'll go straight into Harvest Monday, the link-up hosted by Dave at Our Happy Acres. 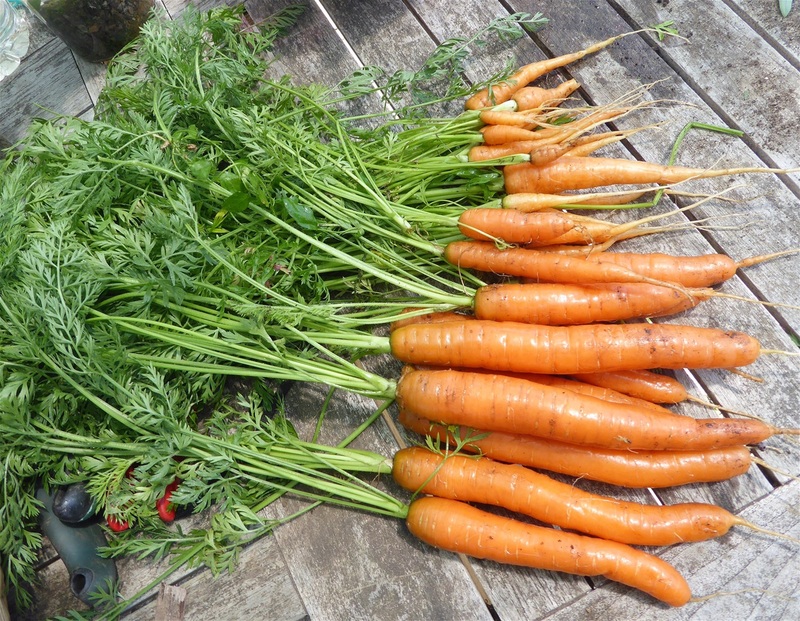 The header photo shows what we brought home on Tuesday last week, with several "firsts"
- Carrots: these are Sweet Candle, which are well named. In fact they are so good the mice decided to tunnel in under the protective enviromesh and eat the tops of any that were above ground. We have found traps baited with peanut butter to be irresistable and the mouse population is reducing daily for now. 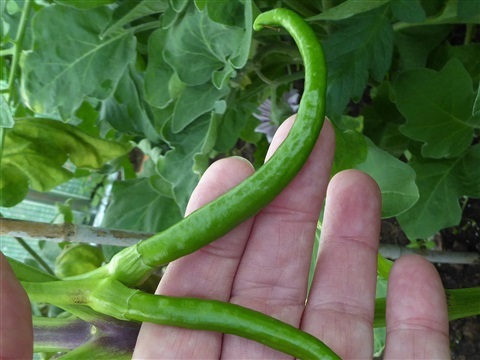 - Dwarf French Beans: These Orinoco were sown in modules on 29th April, and really suffered when they were planted out, as the high temperatures and strong winds nearly finished them off. 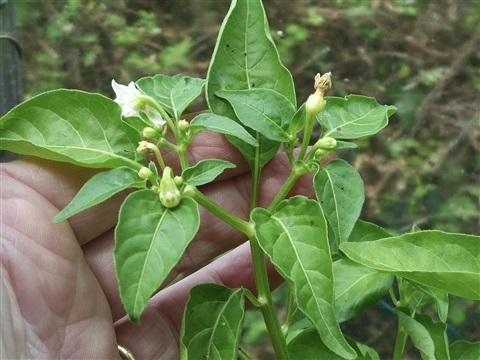 However, with hardly any leaves left at the time, they developed flower buds ... I reckon they thought they were going to die and this was their survival strategy for the future... and now have small, crisp beans to gather, plus new leaves too! 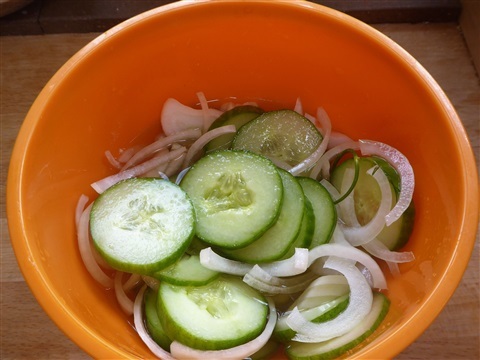 - Lettuce: We have moved on to eating the Little Gems, which, as always, are full of flavour and crunch. - Beetroot: This week we pulled the first of the Chioggia roots. They are the most gorgeous shocking pink, with a bullseye design of pink and white rings inside. Eaten as carpacchio, with some watercress and goats cheese, their colour and flavour was exquisite. If they are cooked, the colour does fade though. The leaves are also very tasty, either in salad or cooked like chard. 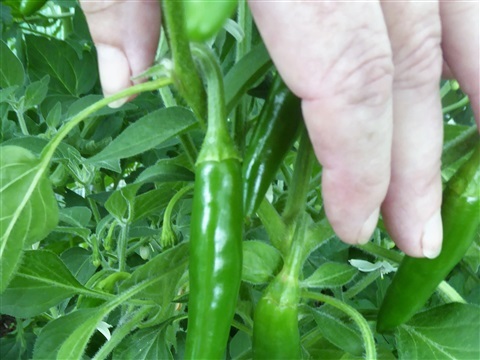 - Sweet Peppers: These are from the mixed varieties packet of seed, and are very juicy indeed. This cream coloured ones seem to grow much more quickly than the others, and we have both blocky ones and pointed ones. 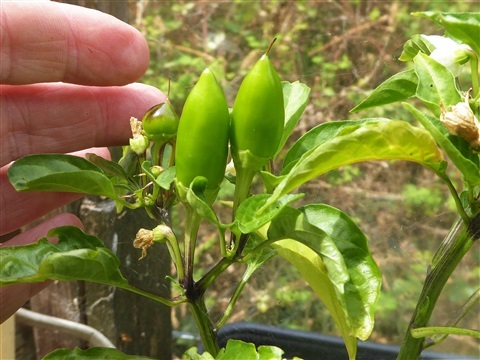 The Hungarian Sweet Wax plants in the giant cold frame are also fruiting now so we shall have plenty of peppers to eat for a while! Then there are the herbs ... Dill and Flat leafed Parsley for potato salad, Mint for adding to iced drinks, and, not photographed, Lavender to infuse the Gooseberry ripple icecream. And potatoes. These monsters are, believe it or not, Lady Christl! 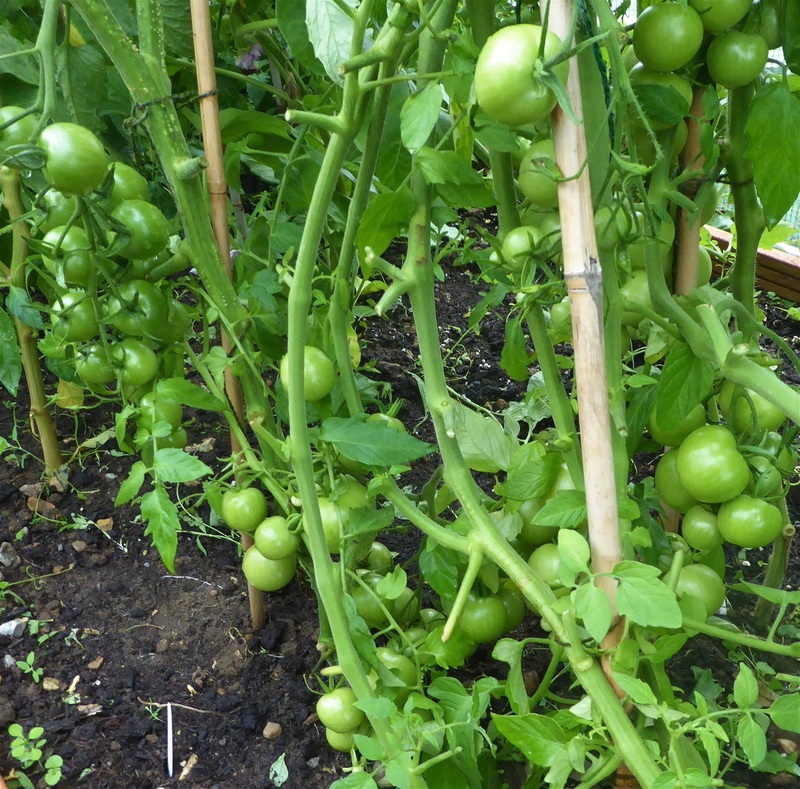 They have been watered well through this long spell of hot, dry weather and it seems to have paid off. These are from the three plants I dug this morning. Once the skins are dried off, they will go into a hessian sack in the garage to be stored. 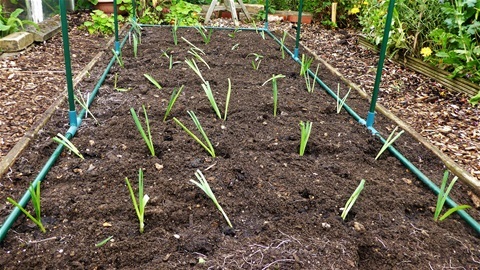 Their space is needed for the leeks, which are bursting out of their tray now! Due to the issues with Leek Moth I plan to cover the leeks with enviromesh through the rest of the Summer and early Autumn. The cost of this seemed extortionate, but after a search around I ordered some from Hong Kong, which took two weeks to arrive... £30 cheaper!!! Worth considering, I'd say. Now we have enough to also cover the leeks that will follow the pea plants too, so they can stay healthy and unaffected by these pests. Just one more little harvest, which was a bit unexpected: Strawberries! There are some new pink flowered plants in a hanging basket at the end of the garden, and I didn't expect much in the way of fruit from them this year, but lo and behold! 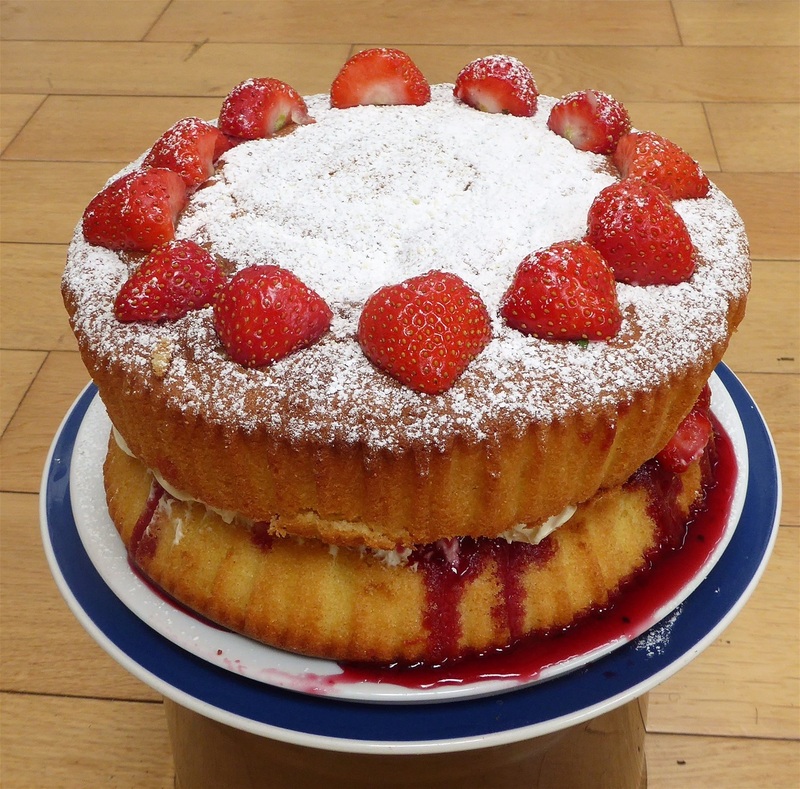 Enough for a cake (recipe ... Strawberry Pudding Cake... already posted) They really are finished now though. 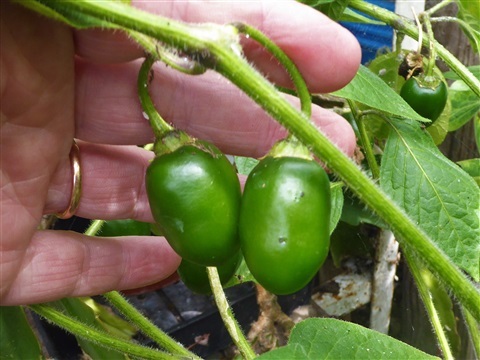 The plants that were in the polytunnel have had a major trim and been resited outside to have a rest after their sterling performance. They can stay out now until next Spring, so that they can have sufficient hours of cold to form flower buds again. I'll give them some Blood, Fish & Bone around February to set them up for their next crop. 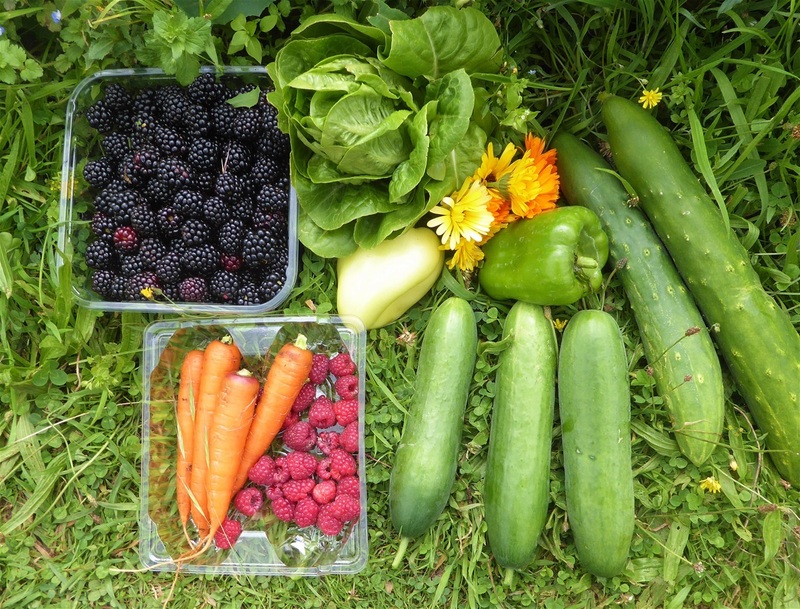 And that is the end of our harvests for this week.. we feel privileged to have such bounty! 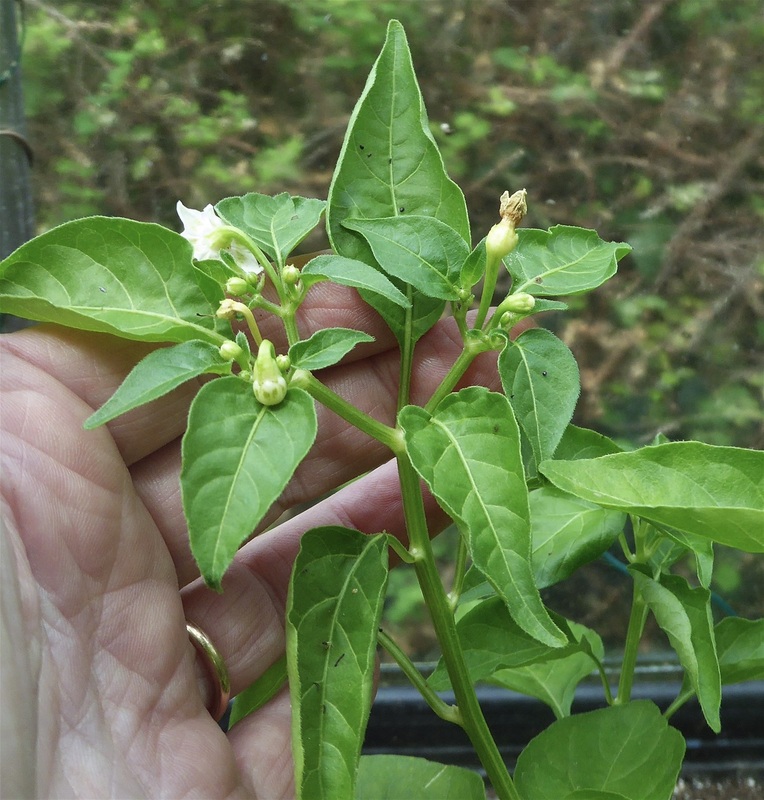 Serrano from Mexico, with soft hairy leaves and white flowers. 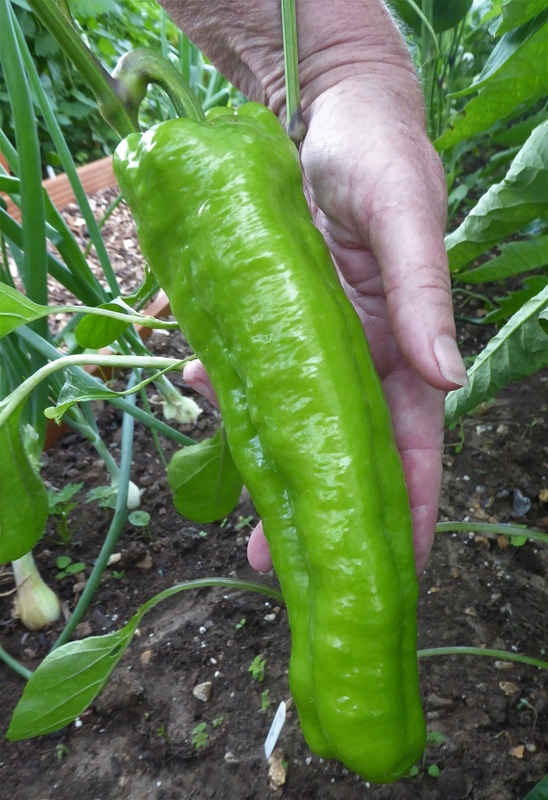 Padron peppers from Spain.. some are hot, some are not! Mostly this week we have been watering, watering, and watering. 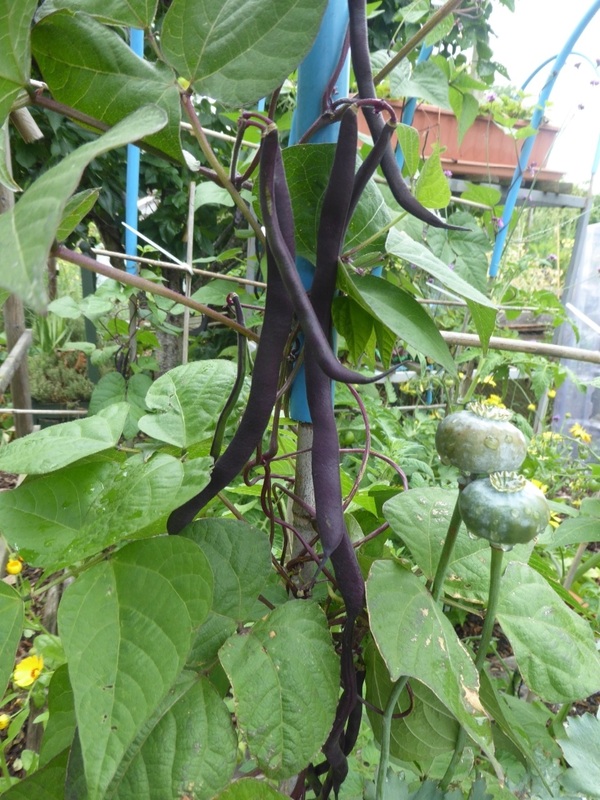 The runner beans are beginning to set pods, maybe by next week we may have a few to pick. Most of the squash plants are also setting fruit: I have taken off their shade netting now and they seem to be coping well enough. The sweet potato plants haven't grown at all yet, but they must surely be enjoying the hot weather. They look OK, I am just impatient to see some action! Last Winter we lost most of our dahlias, when we absentmindedly left them out in a shed, so we bought in some new tubers. 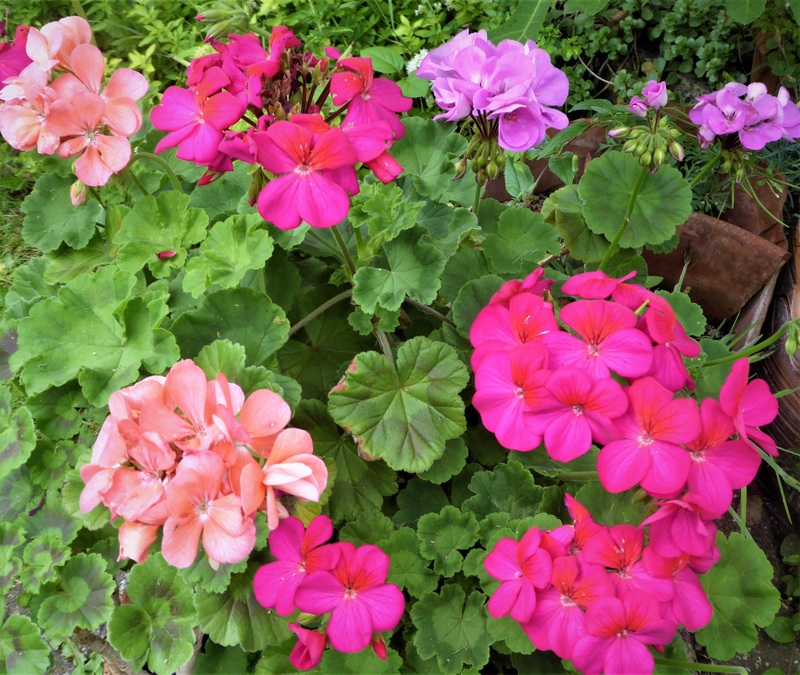 They were mixed, un-named varieties, and some are beginning now to open their buds. 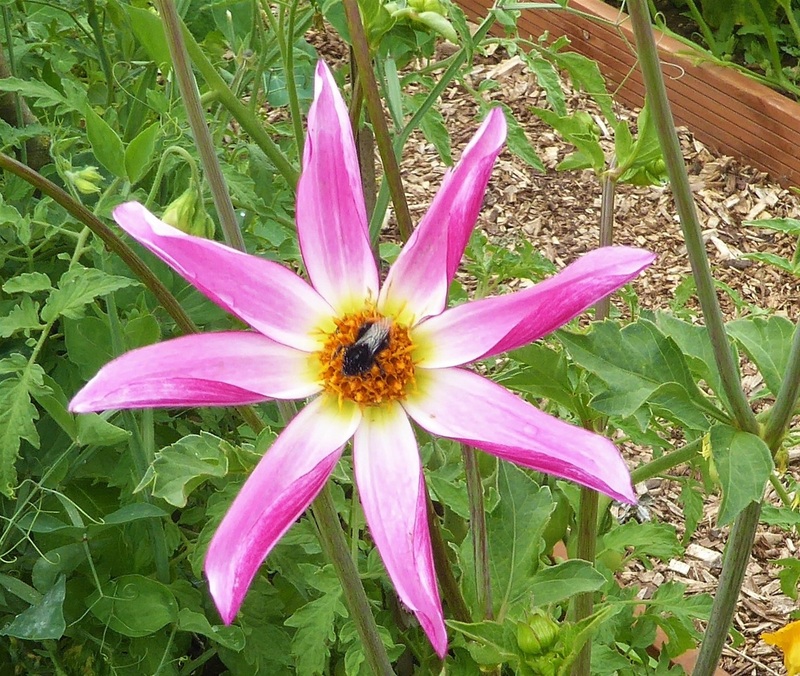 We have white, dark red and dark maroon so far, with one really lovely star shaped single pink flower. 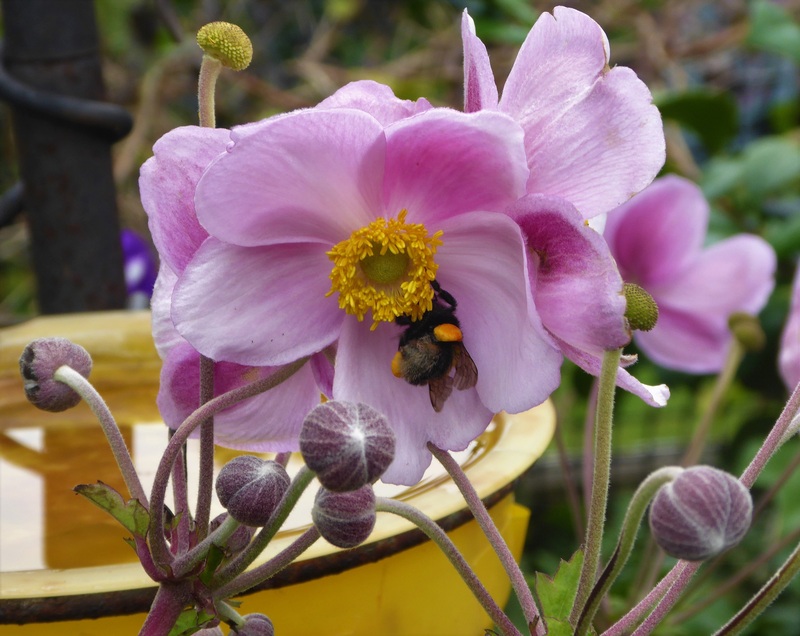 Popular with bees too, as you can see! 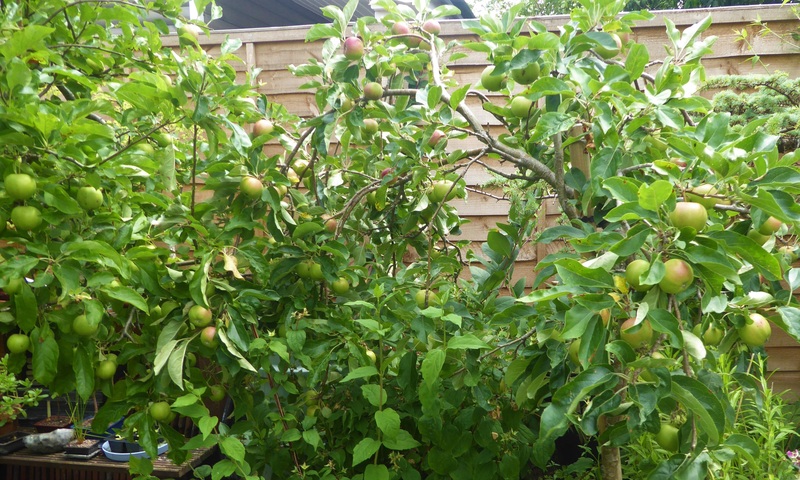 And here to end this week are pictures from our garden at home: two hanging baskets, the apple trees, some of the blueberries and some pears. 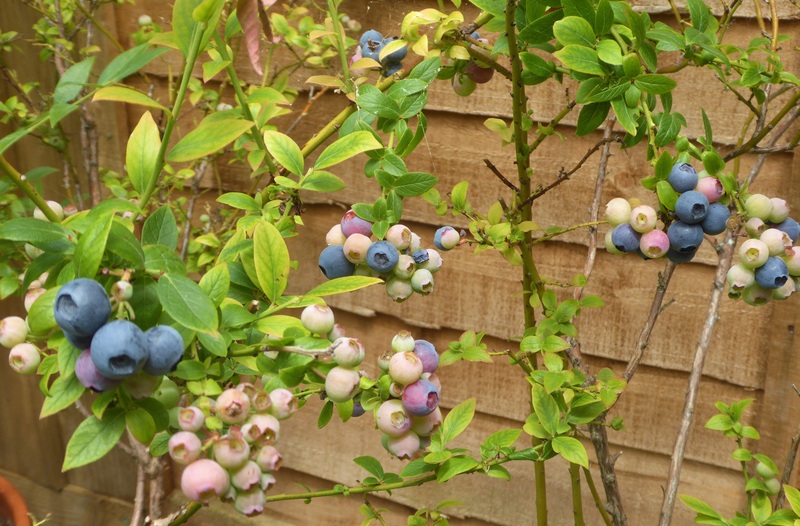 Looks like there is plenty of fruit to come in the Autumn. Thank you again for reading this. 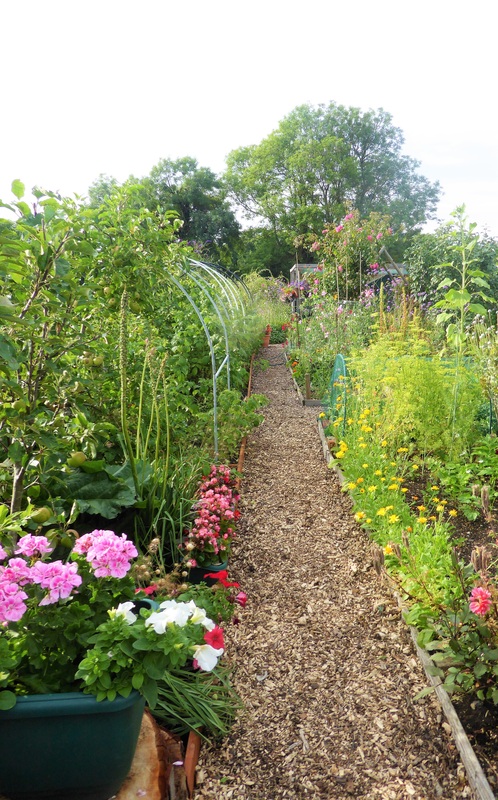 Next week I hope we have at least some of the leeks planted, which will mean the first early potatoes are all up and the old pea plants taken out. We shall see how the time goes! 3rd July - The currants nearly overwhelmed me! After four hours of picking, this was the outcome two days ago. 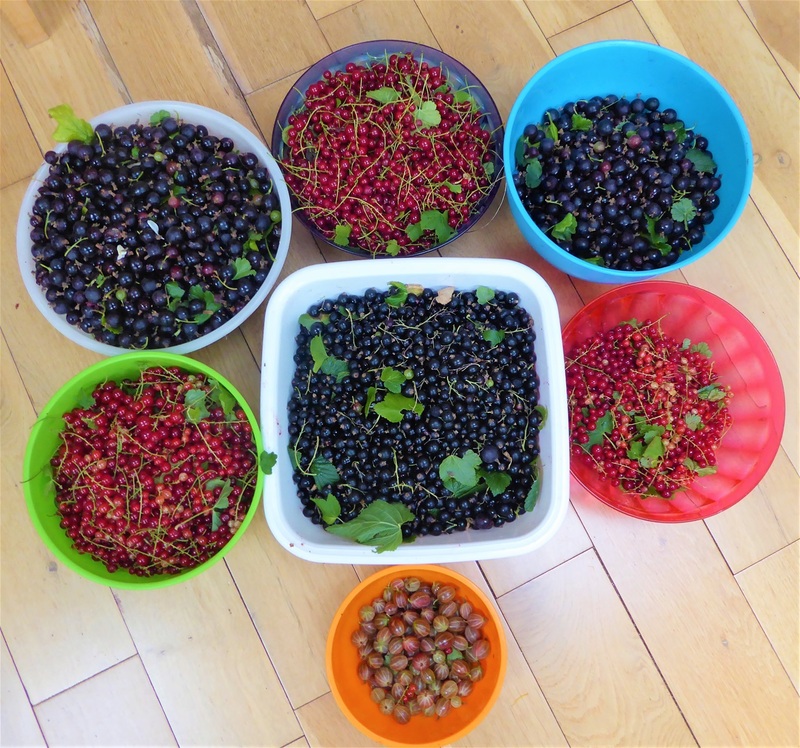 The blackcurrant bushes were bowed down with the weight of fruit, and the single jostaberry bush had more fruit per centimetre than I have ever seen. 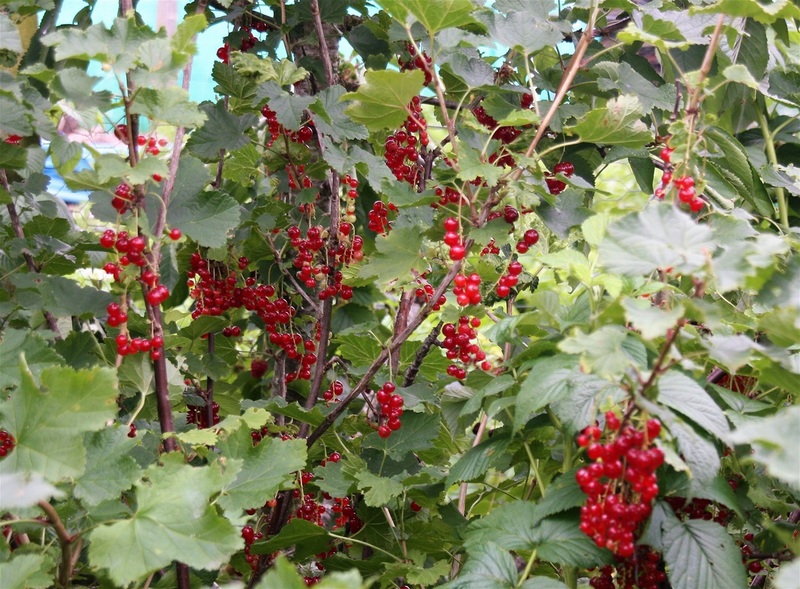 The redcurrants hung down in glistening scarlet cascades, whilst hiding amongst the prickles were pink gooseberries! This bush has never fruited before, and I was amazed to see so many just hanging under the branches like rows of pretty lanterns. And so begins Harvest Monday, hosted by Dave from Our Happy Acres... see the link at the end. The huge net has been taken off the fruit cage, having done a sterling job in protecting our harvest from the ravages of pigeons and blackbirds, and it is now tightly twisted and stored away for next year. 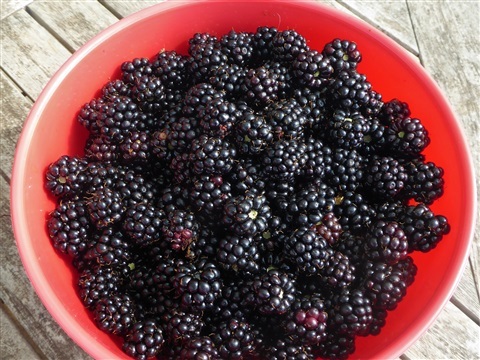 There were so many berries, I didn't pick them all, so the birds can now enjoy what is left. 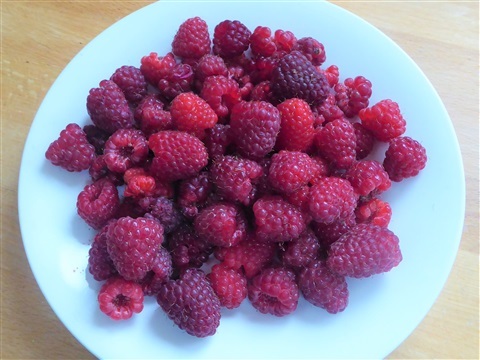 There was also a large number of raspberries that ripened this week, and as these looked like the end of their fruit for this year, I pruned out the canes and then picked off the fruit. That left next Summer's nice fresh green canes with plenty of space to grow, and made it easier for me to get in amongst those currant bushes too. 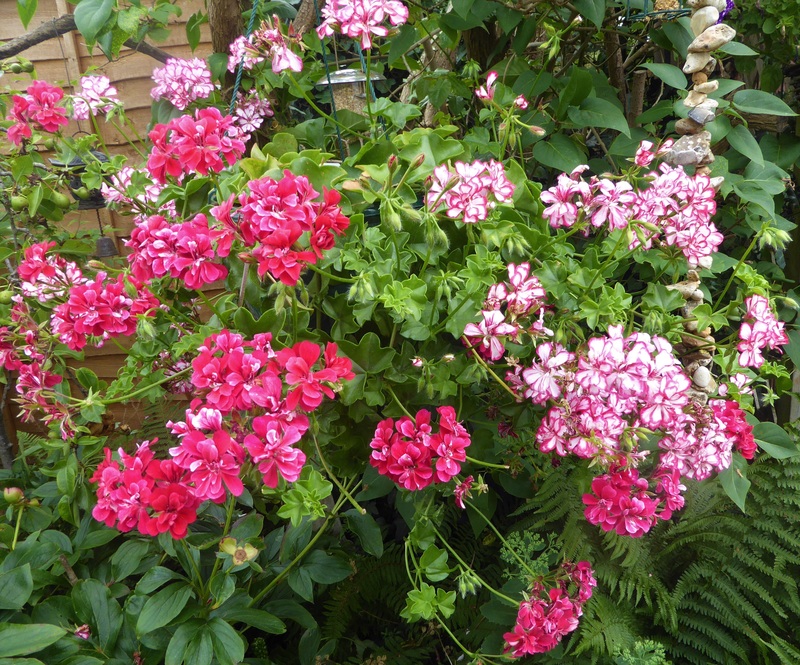 I pruned them as I went along as well, so although it took ages, the job is done! Abi also replaced the old wooden edging to the bed, so all in all it is looking quite smart. The original was old pieces of mismatched wood, whatever we had to hand at the time seven years ago, so it is luxury to have level boarding along the edge of the path now, in a proper straight line! Of course, harvesting all this fruit means cooking/preserving it, and this year I have been determined not to just put it all in the freezer and forget about it. 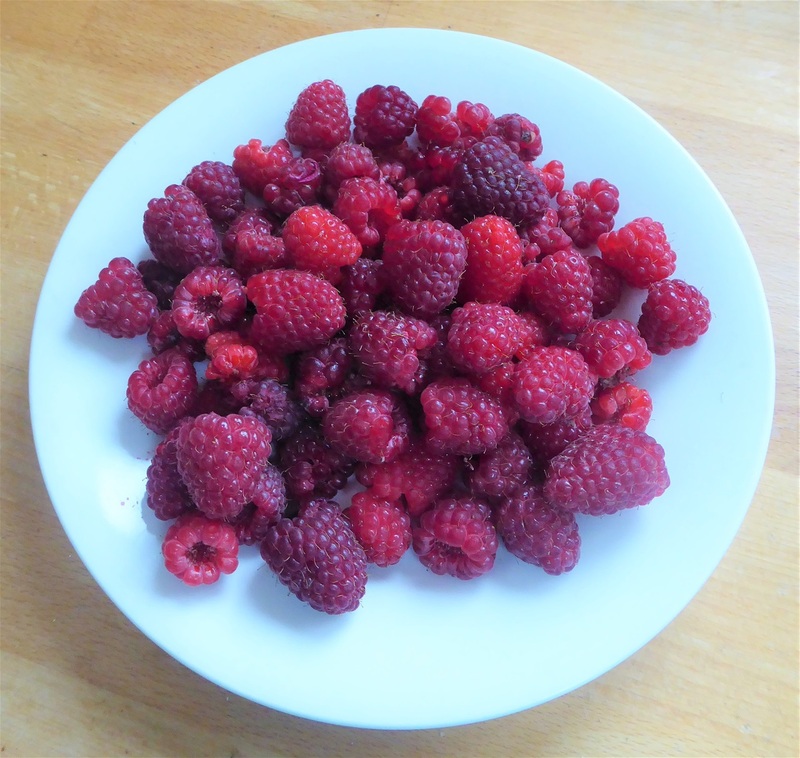 I have frozen some of the raspberries for each of our children's families, and there is a tray of redcurrants now in the freezer, but they have a purpose later in the Summer, and will be transformed into a cheesecake and redcurrant coconut slices when required. - jostaberries dripping through a jelly bag, ready to become jelly once I have sugar available, as well as some juice to make a "shrub" with brandy. Not made this drink before, but it sounds intriguing. .... and I have purple fingers, and a lingering aura of blackcurrant sweets!! 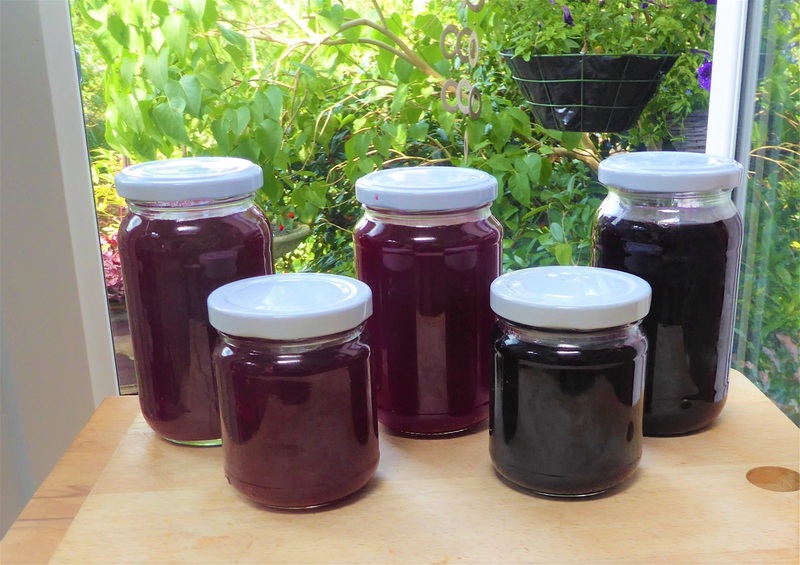 Here are some of the jars of gooseberry & redcurrant jam and of raspberry jelly, just a couple so that you can see their colour: the redder ones are the jam. 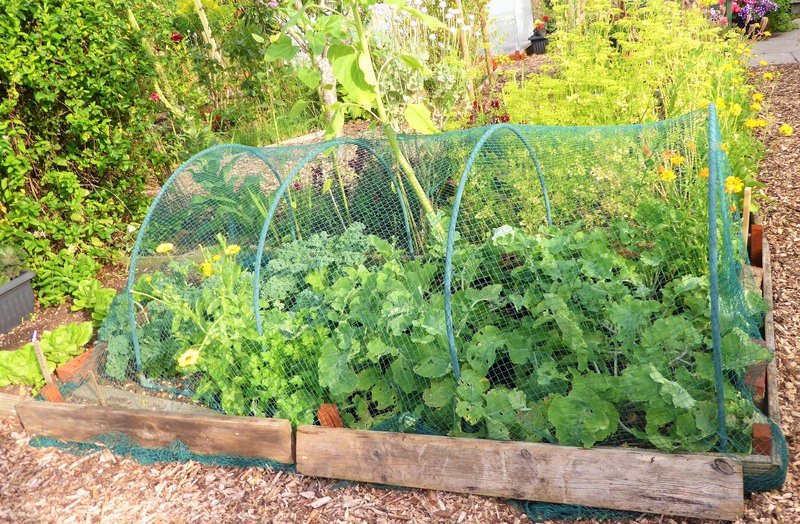 Moving the bean plants out left a whole empty bed, so after a bit of weeding, watering and a feed with blood, fish and bone, in went a couple of sweet potato plants under a large cloche, and some lettuces: red salad bowl and butterhead, still sticking with my lettuce succession! 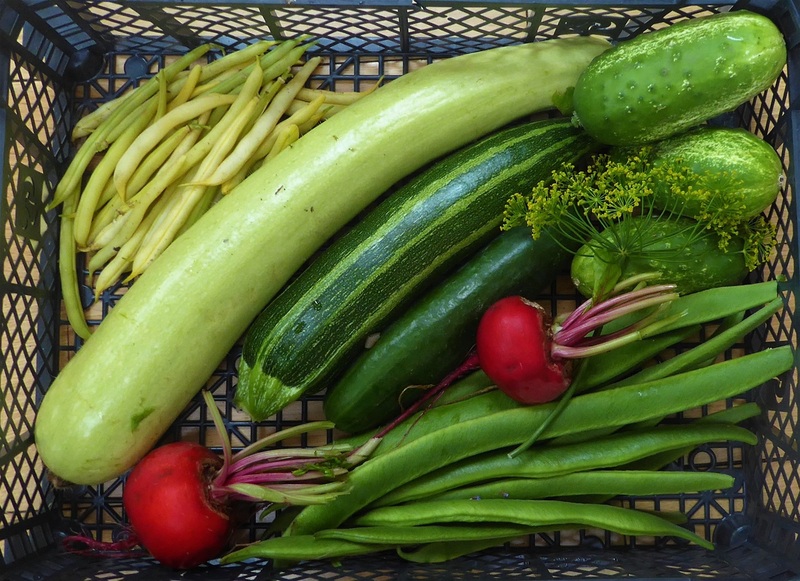 We have continued to gather courgettes, and to pick peas, which are blanched and frozen as soon as we come home, unless they are going to be eaten that day of course. 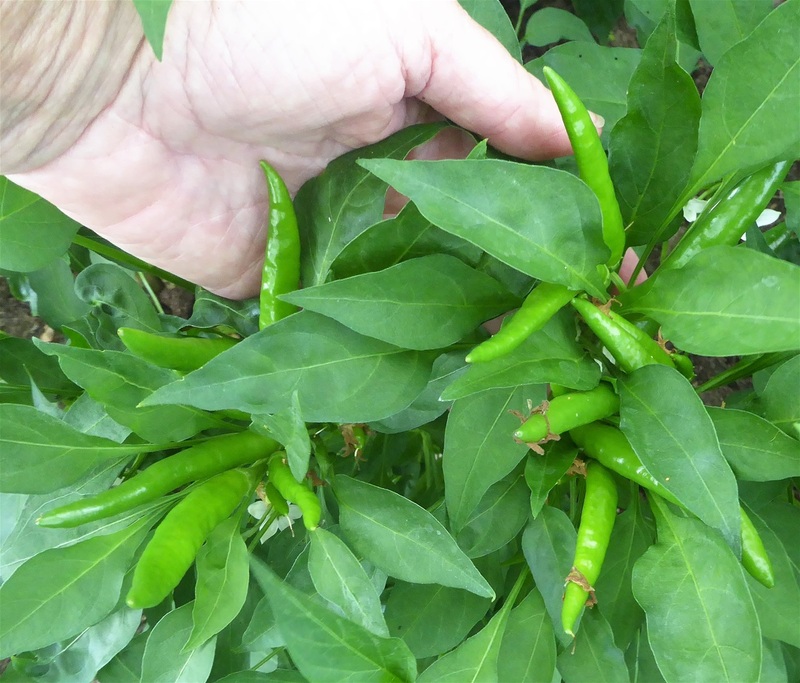 The early mangetout have finished, and the giant Bijou plants have mysteriously died. Very odd indeed. One minute they were fine and then suddenly the foliage turned yellow and that was that. Can't win them all! And that is the end of our harvests this week. The other big job at the moment is keeping up with watering to ensure plants are not stressed. We have had a couple of showers overnight, but not enough for a good soak, so it has been out with the hosepipes. 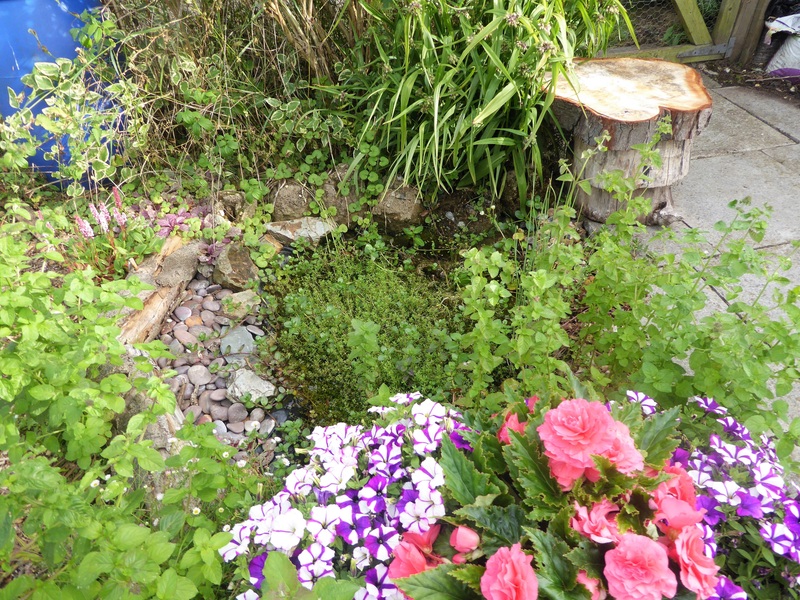 Last year we did not water the potato plants regularly and the tubers grew strange split-smily shapes, so this year we are trying to give them all a decent watering every week, directing the water under the foliage into the ground, rather than onto the leaves. 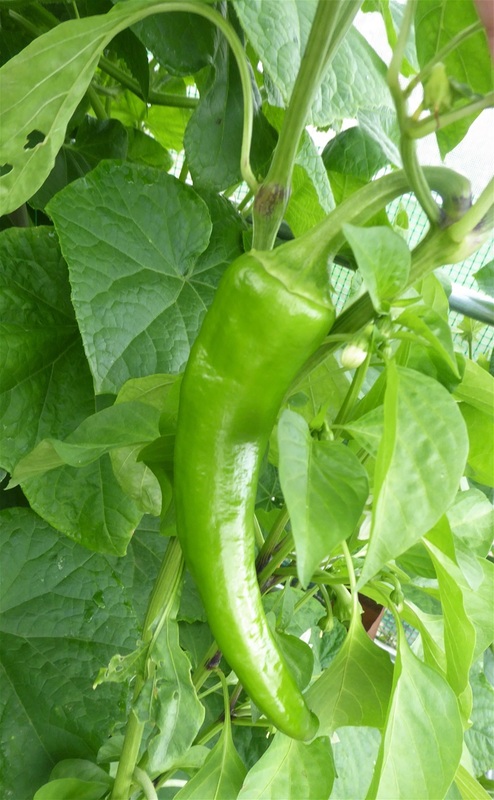 The plants in the polytunnel need watering every other day at the moment. 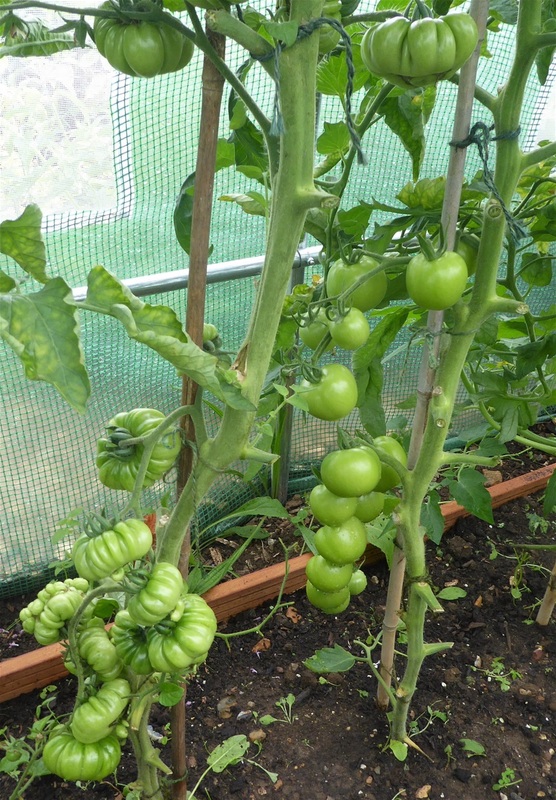 The cucumber plants have nearly reached the top of their supporting net, and there are lots of baby fruits growing, and the tomatoes are in full flower, with obvious green tomatoes now showing too. 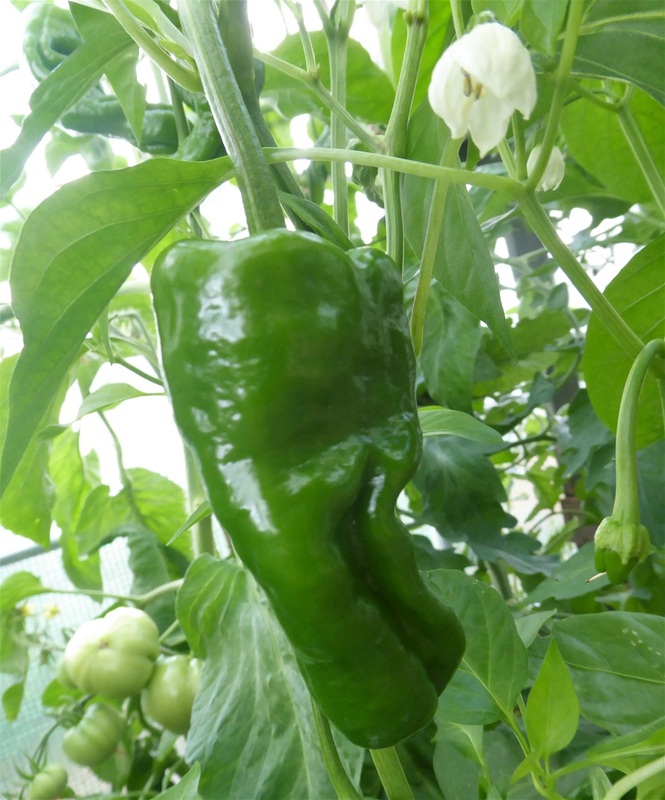 Lots of flowers on the aubergine plants but no fruit setting... Is the air too dry?...and the chillies and sweet peppers are covered in green fruits. 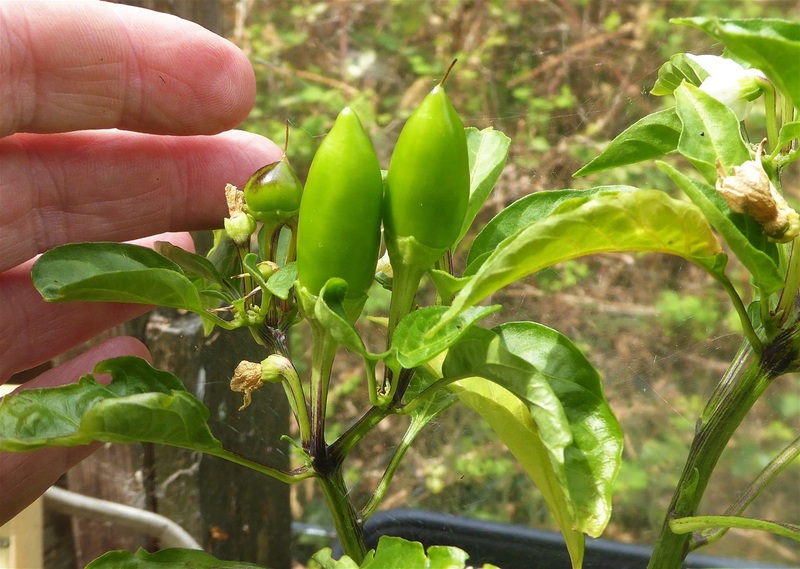 Might be time to start using some of the chillies now. And the sweetcorn plants are more than knee high now. These did go in very late, but with the tunnel extending the season I hope they have time to develop cobs. 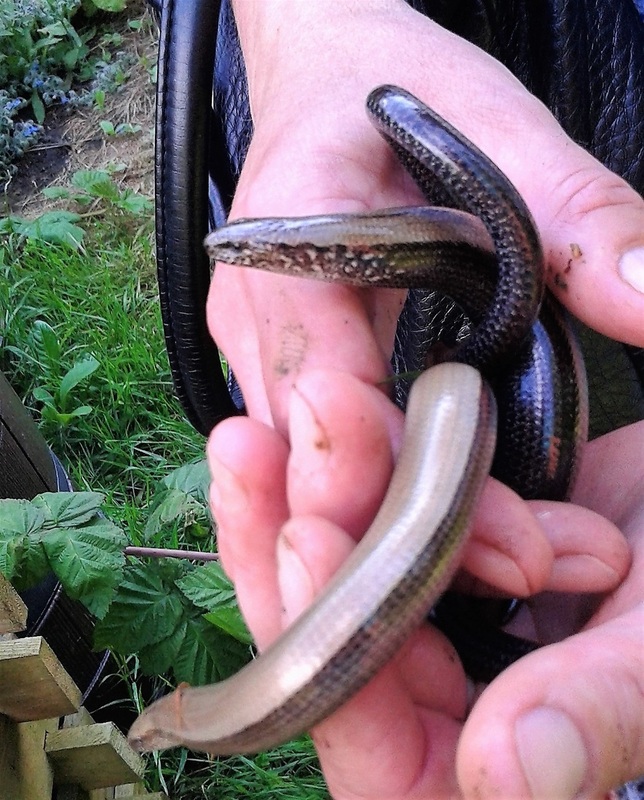 This is an endangered species and so having one on our plot was something to be pleased about alright! 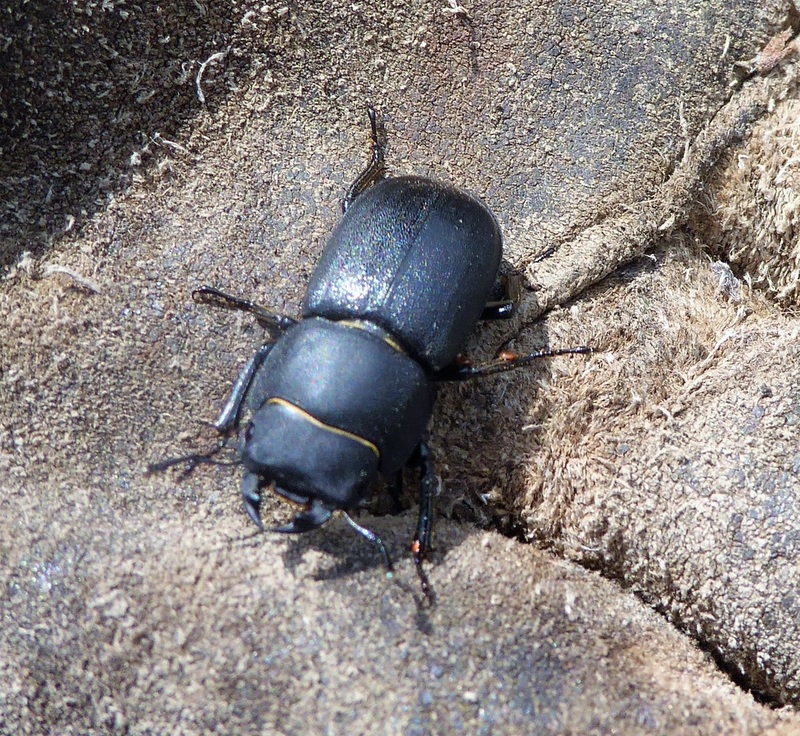 When we released her back onto the repositioned logs, she made a bee-line for the bark mulch and burrowed her way in, which is what mated females do to lay their eggs. When these hatch, the larvae, which eat rotting wood, take eight years to grow large enough to pupate and then hatch out as adults. We shall be part burying another oldish log as well, to increase their chances of future success. And on that happy note I shall sign off for this week! I hope you enjoyed sharing this update, and as always, thank you for reading it.